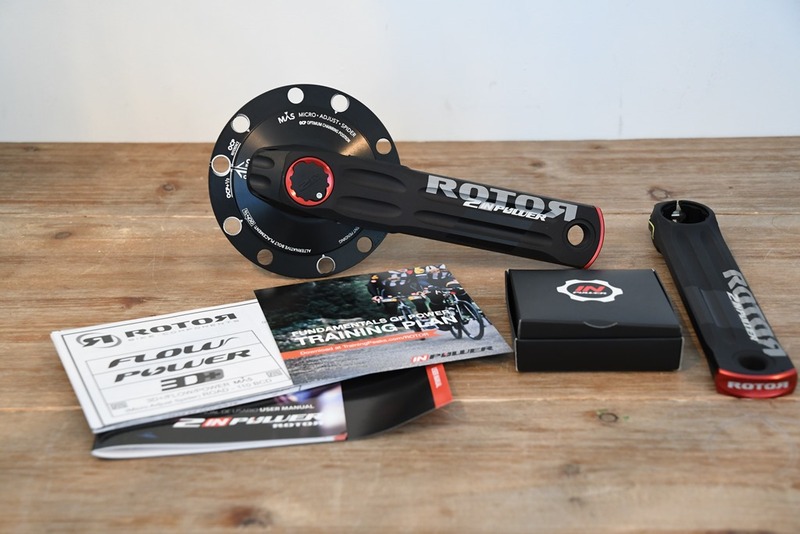 Over the last few years, ROTOR has been slowly increasing both the quantity of power meters they make – as well as the types of power meters they make. It first started with the original ROTOR Power LT some three years back, and then two years ago they introduced the left-only variant, INpower. However, last spring they announced the dual left/right variant- 2INPower, which they started shipping this past fall. 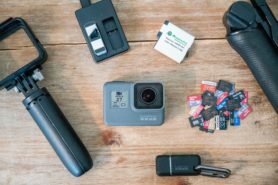 That dual left/right leg variant that includes both ANT+ & Bluetooth Smart is what I’m covering in this review. I’ve been riding a ROTOR 2INpower lately, covering a wide assortment of conditions. A number of indoor and outdoor rides across all sorts of lovely winter-ish (and now spring-like) conditions. In doing so, I’ve been recording boatloads of test data, with usually 2-3 other power meters on the bike at the same time. Like normal, I’ll be sending the unit back to ROTOR once I’ve wrapped up the review. With that – let’s dig into what’s in the box and then get it setup on the bike. 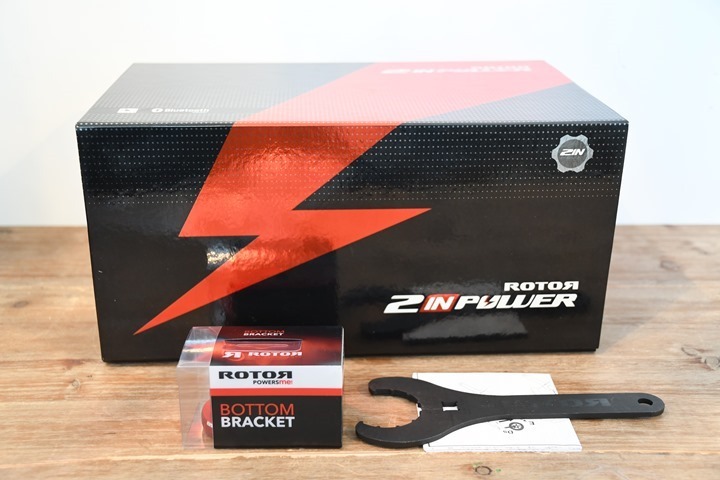 When it comes to power meter unboxing’s, there’s no bigger box than the ROTOR 2INpower kit. It’s like one of those egg-drop tests you did as a kid where you design the packaging to protect the egg being dropped from the top of a fire truck ladder. Above, you can see the left and right crank, the spider (attached to drive-side right crank), some paper manual stuff, and a small box of parts. Here’s a closer look at the two crank arms…which really do look stunning in that color design. Oh, and don’t even think about removing that bolt. If you do ROTOR will reach out and kick you in the nuts…which is fair since that’ll be less painful than the crank arm falling off while riding. Inside you’ll find the USB charging cable, two spacers for installation, and bolts to attach your chainrings to the spider. Now as I noted earlier, your exact box will vary a bit based on which chainrings you select. In this case, you’ll need both an inner and outer chainring. For my testing, ROTOR sent me over both a set of q-rings (non-round, oval rings), as well as regular round rings. I focused on round rings, since it allows me to more accurately compare power between varying power meters. Though, the support of q-rings is a key benefit of ROTOR’s power meter platform over many rivals such as Quarq and SRM which don’t support non-round chainrings. With that, you’ve got all the parts accounted for. Thus, it’s time to get installation completed. As usual with crank region power meters, your installation will vary based on what you had on your bike previously. In my case, for example, I needed to swap out the previous bottom bracket for one compatible with the new power meter. No big deal, but if you don’t have the right tools to do so, you’re pretty much hosed. So just keep that in mind (or, chat with your friendly local bike shop and have them take care of it for you). Next, I got all the parts laid out on the floor. There was quite frankly a crapton of parts in this box. Not in a bad way, but just in a quantitative way. Then it was off to put the chainrings on the crank arms. If you’ve never done this before, it likely looks harder than it is. But really, it’s just going ‘round and ‘round with a hex wrench and five bolts to get them tight. 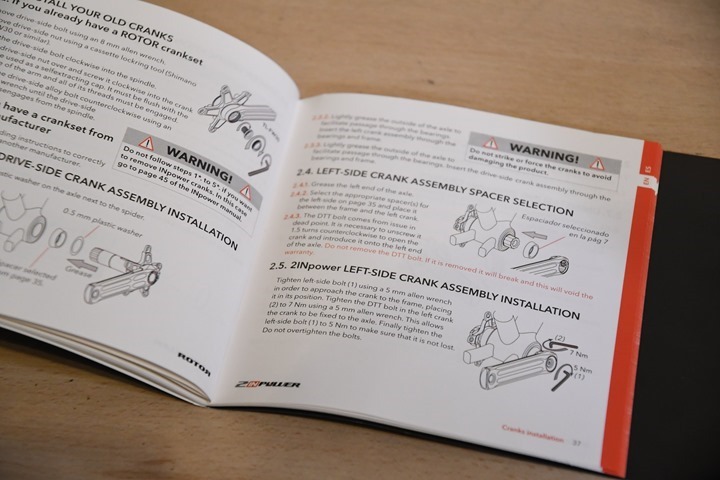 Next comes consultation with the manual on using the funky-ish bolt system of the ROTOR cranks. 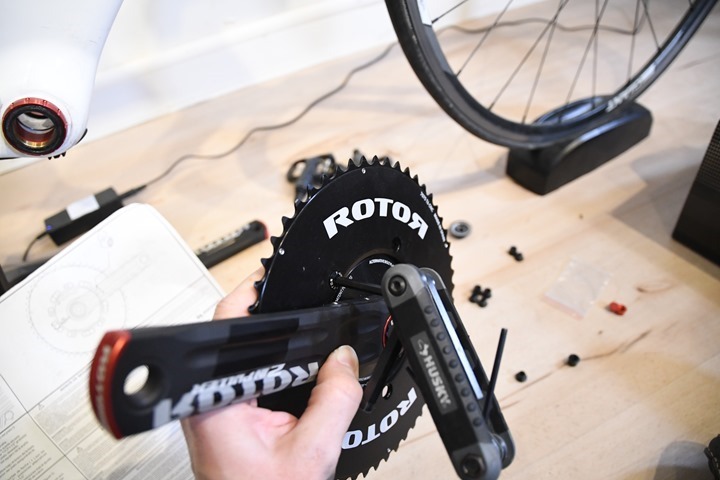 Again, not hard, but if like me you don’t install ROTOR cranks every day, then you’ll want to ensure you know which order to tighten which bolts. Then as always, grab that torque wrench to validate everything is up to spec. Don’t want anything to fall off now…do ya? With that – you’re done. Technically you’ll also do a zero offset/calibration, but I’ll cover that in the general use section below. It’s the exact same no matter when and where you do it. Also, as a general rule of thumb with power meters, I’d recommend doing a few quick sprints (5-10 seconds, 3-4 times) on a trainer to tighten everything up. Then zero offset again just for fun. While charging, the unit will slowly pulse the light, which is somewhat soothing. You know, in the event you sleep next to your bike at night. You’ll receive a confirmation back of 1000 on the head unit. After which you’ll then rotate the crank arms two full rotations, and press calibrate again, which should give you a new number that’s +/- 200. In my case, it floated between 72 and 77. It should give you a successful message, and you’re looking for the values to be consistent each time you do them. This appears to be a bit different than how other power meters work in that they tend to give you details on what might have shifted. Whereas the ROTOR instead seems to give me the same numbers every time. Note that you can also complete this task via the smartphone app as well, but more on that later. You can/should also set the crank length in the settings as well. In my case, I use 175mm cranks, so it’s different from the 172.5mm default. The difference for round-rings would be about 1-2%, somewhat based on cadence, between those two values. So it’s worth getting right. 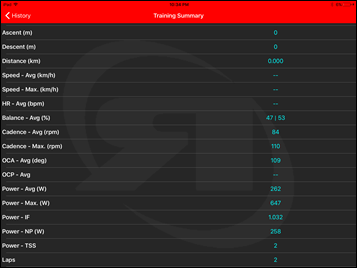 Here’s an example of a ride file recorded on a Garmin Edge 520, that shows what data you get when paired to the ROTOR 2INpower. You can also look directly at the linked file here on Garmin Connect. 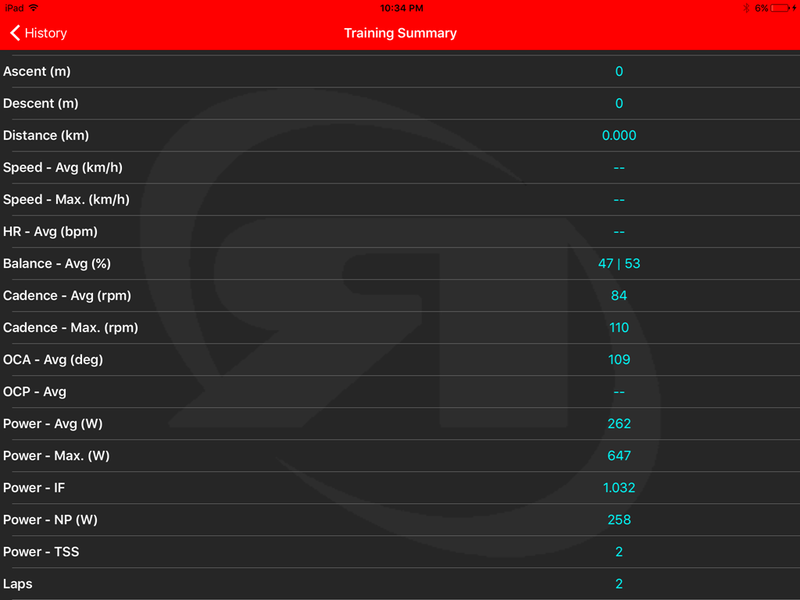 Finally, I normally include in this section details about the app – but since ROTOR’s app is a bit more detailed than most other power meter apps, I’ve decided to let it grow up and get its own section. 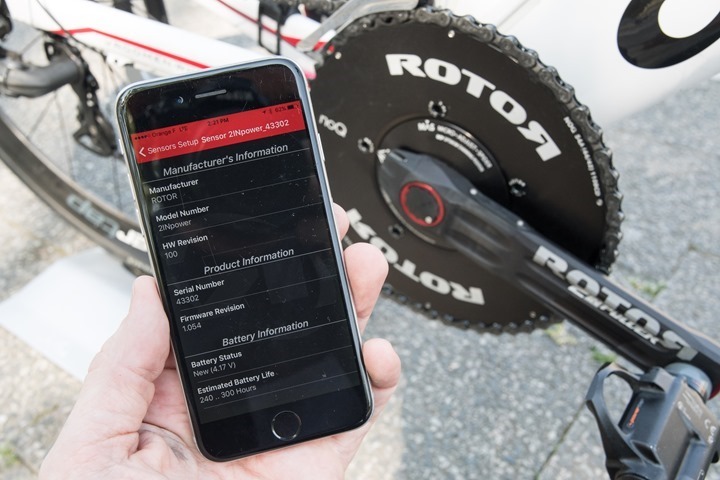 ROTOR has long had a more detailed power meter app story than most other companies. 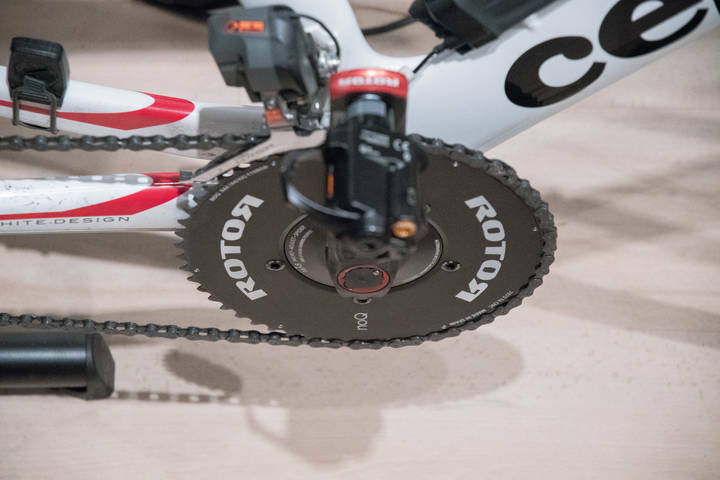 One of the key benefits that ROTOR likes to demonstrate at shows and bike events is how the unit can display your pedaling force in a graphical manner in real time. 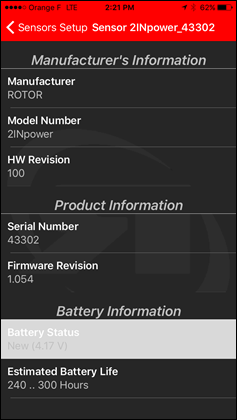 With 2INpower, the easiest way to do that is to use their free app, aptly called ROTOR POWER, which can be downloaded for iOS or Android. In my case, I used it as both an iPhone and iPad app. For the iPhone side of things, it’s useful for quickly checking firmware or settings. As well as doing a calibration in the odd event that your app of choice can’t send a calibration command to it. You’ll start by searching for the sensor (or, a heart rate sensor). As seen above you can calibrate the unit or pull up basic product ID and battery settings. It’s all somewhat basic. 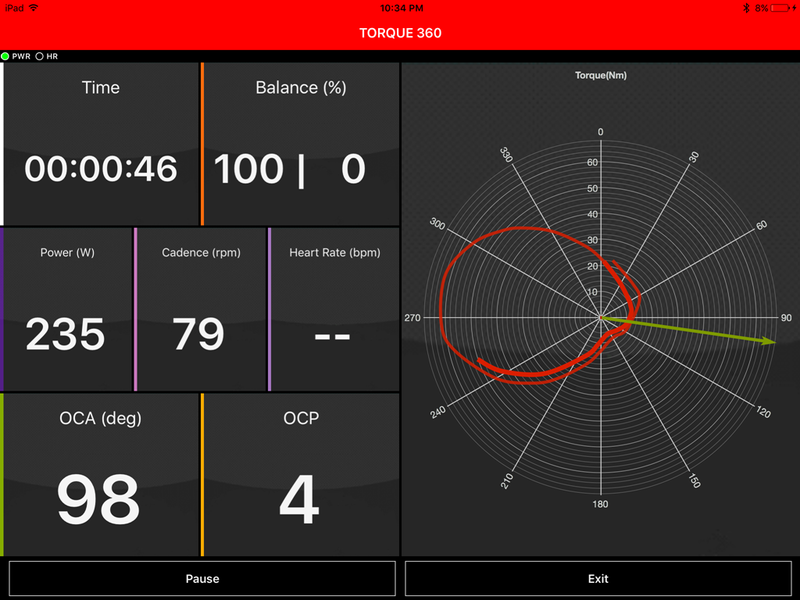 Ride, Basic Training, and Torque 360 are all the analytic side of the program. Service is basically what you saw above with respect to checking settings and information. And history just shows you files from the previous three analytic sides…except without being able to export or do anything useful with them. 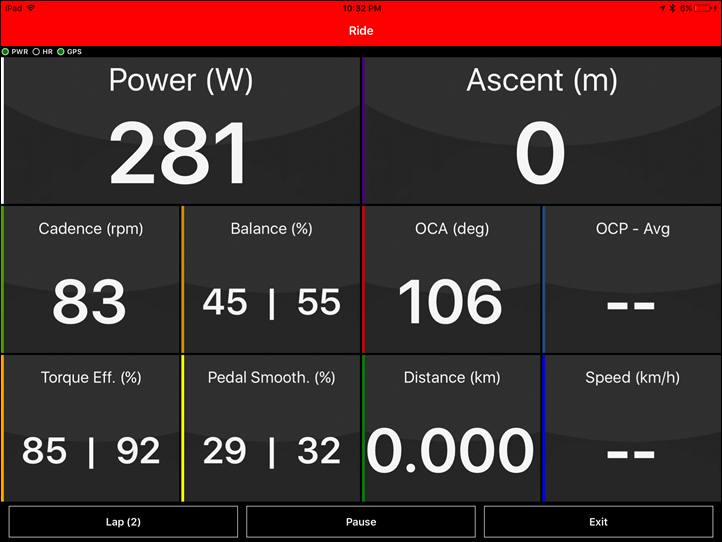 Looking at the ‘Ride’ side first, you’ll get data shown and recorded from the power meter. If using GPS outside (such as on a smartphone), you’d also get speed/distance/ascent data. All the metrics you see to the left are near identical to what you’d get on a head unit. 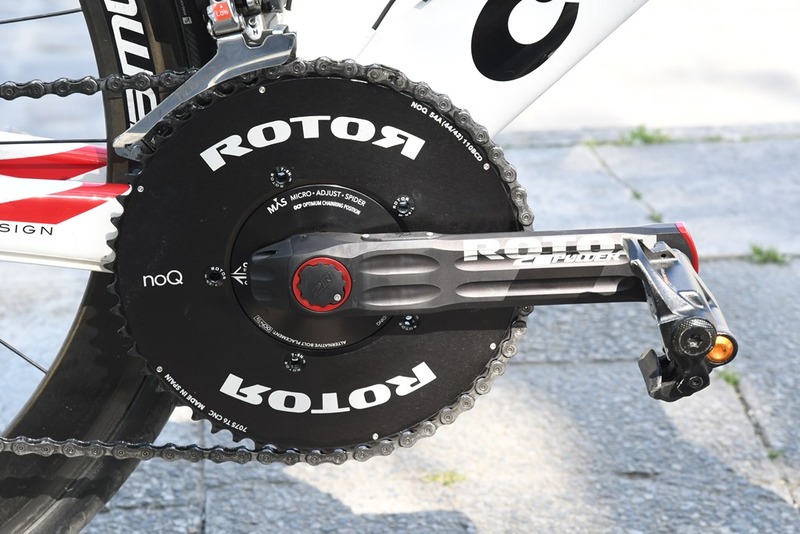 Whereas on the right-hand side the OCA (Optimal Chainring Angle)/OCP data is unique to the ROTOR program. To dive into the OCA/OCP pieces, let’s switch to the ‘Torque 360’ app, which shows what’s going on in more detail. Within this, you can see my pedal stroke analysis on the right side. In the below screenshot I’m pedaling with both legs, and thus things are pretty normal in terms of balance as well (48%/52%). But now watch as I do a left-only and right-only leg pedaling, below separately. You’ll see not only does the balance shift, but so does the torque plot. More importantly in the above images is that the balance goes to 100/0 and 0/100. That means it’s correctly zeroing out the leg not pedaling. Some power meters might show 98/2 and 2/98 or similar. So it’s good to see it cleanly 100/0 or vice versa. At the end of doing your analysis/ride you can view a summary, which in turn also saves the data to your device for later retrieval. Finally, within the ‘Basic Training’ option, you get metrics similar to the above, except with some pretty timeline graphs, plus you get the ability to see torque displayed in bars. Once completed with your rides, the app will save the files into a folder on your smartphone with a .FIT and .CSV file. Unfortunately for iOS users this means having to plug your device into a physical computer to get the files off, as there isn’t a simple e-mail/send option. For Android users it’s the same, but at least you don’t have to use iTunes on the computer. Given this is really just the first version, hopefully we’ll see ROTOR add those features soon. As always I set out to find that out. In power meters today one of the biggest challenges is outdoor conditions. Generally speaking, indoor conditions are pretty easy to handle, but I still start there nonetheless. It allows me to dig into areas like low and high cadence, as well as just how clean numbers are at steady-state power outputs. Whereas outdoors allows me to look into water ingest concerns, temperature and humidity variations, and the all important road surface aspects (i.e. vibrations). With a configuration like the ROTOR 2INpower, I’m somewhat limited on placing other crank/crank-arm based power meters on there. So I have to compare with other pedal units and hub based units, both of which I primarily prefer PowerTap’s options due to ease of transfer. In general, my use of other products is most often tied to other things I’m testing. Also, when it comes to data collection, I use a blend of the NPE WASP data collection devices, and a fleet of Garmin head units (mostly Edge 520/820/1000 units). With that, let’s get right into it and start with analyzing an indoor trainer test, the ‘dreaded’ 30×30’s. I often use this in both trainer and power meter reviews as a way to evaluate how quickly a given unit responds to vast changes in power. 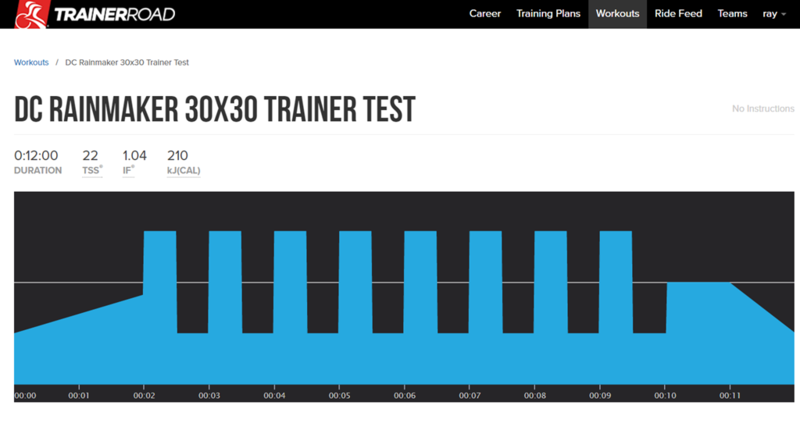 I’ve created a custom TrainerRoad workout that quickly tests this in a matter of 12 minutes. As always, here’s the uploaded file set from this workout in the DCR Analyzer, which you can download the original files or use the online analyzer to take a look. Side note: You can actually try out this same test workout yourself. 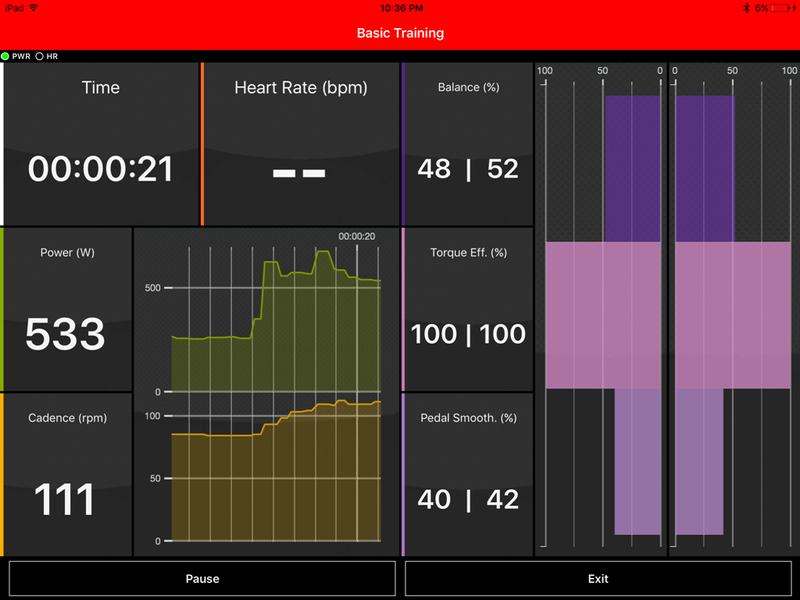 To do so simply join the DCR TrainerRoad ‘Team’, which is the way you can share custom workouts with others. You’ll see said workout in there and can then give it a whirl yourself. As you can see, all three units track the change in power virtually instantly, which is a shift from ~140w to ~400w, held for 30 seconds before recovering and repeating 8 times. However, what you see is a bit more separation than I would like between them. Specifically, the ROTOR 2INpower is reading a bit higher than I’d expect. You can see that when I zoom in, where the difference seems to be about 15w higher than the others. Now normally you’d see drivetrain losses between the crank and the rear cassette (i.e. the Tacx NEO and crank/pedals), but that wouldn’t account for the losses seen between the P1 and the 2INpower. And then from a purely technical level, the 2INpower should be ‘below’ the PowerTap P1, with the P1 reading the highest (since it’s closest to the foot/leg). Now in most cases, you’d see almost no difference between a crank and pedal based power meter, maybe a watt or so. So this is more than I’d like to see, at about 3.8% high (assuming 15w on 400w). That’s just barely technically within the boundaries of +/- 2% on both the ROTOR and PowerTap units, so technically it’s OK, but I’d prefer to see it closer. And to be fair, I’ve seen similar separations between the P1 and Quarq DZero as well as PowerTap C1 power meters in other trainer tests, so it’s not unheard of. For the most part, the separation stays constant throughout that test, though at the end we see the Tacx unit drop substantially from the rest during a quick one-leg test. Not sure why, that’s odd. Next, before heading outdoors, let’s look at another indoor test – this one on Zwift. This was relatively short – about 25 minutes, but shows more stable riding, with one sprint tossed in for good measure. We see a similar pattern here of it generally reading high by about 8-10w on 210w, and more at higher levels. You may be wondering why the units may appear evenly spaced, but I’m not giving the P1’s vs Tacx Neo as much of a hard time? Well, simply put, the difference is explainable. Drive train losses plus accuracy ranges easily account for that 11-12w difference. They don’t account for a 20-22w difference between the ROTOR and NEO, nor the 8-10w difference between P1 and ROTOR. But again, there have been cases of similar tests I’ve done in the past where we see this sort of splitting on the Quarq and C1 units, among other power meters. Here’s another Zwift workout as well. 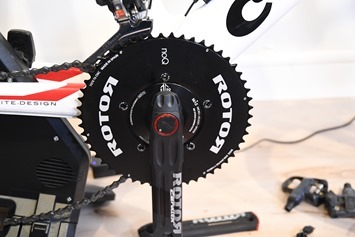 Again, the ROTOR reads slightly higher than the other this time as well – in the same ballpark as the previous two workouts (though slightly more in some cases). Interestingly the P1 gets close to matching the NEO in most places here. 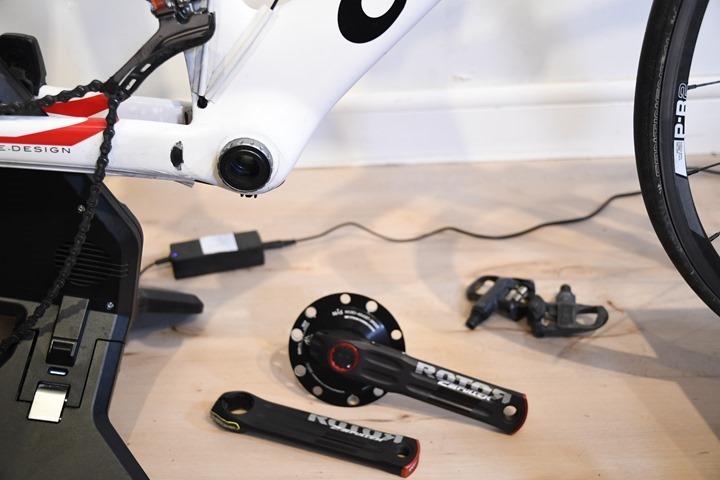 – Indoor rides with the Tacx Neo, PowerTap P1, and ROTOR 2INpower: All of which have the 2INpower slightly higher than expected. – Indoor rides with the CycleOps Hammer, PowerTap P1, and ROTOR 2INPower: Again, 2INpower slightly higher than expected. Ignore the fact that the Smart Control drifts like an iceberg and has useless power data. But the PowerTap P1 and PowerTap G3 data, along with the ROTOR data was good. In fact, if we ignored the Kinetic data, you’ll see that ROTOR performed much better in this bike swaying setup than not. Though, it still read slightly high – but at least within reason – a mere 2.8% difference across most of the ride. At this point, I’m putting this in the unexplainable camp of ‘it doesn’t like static trainers that much’. I don’t have a magical pony answer though as to why. The data is what it is. So, I took the data back to ROTOR, and let them poke at it some. In their opinion, we see a bit more divergence between the pedal based and crank based power meters indoors across many sets of data I’ve provided (beyond just this review). Meaning that they’re saying that the differences are no different than past reviews. And in some of the workouts above, that’s definitely true (as I noted earlier). Yet in others, like the 1st 30×30 test, that’s not true. It’s just a lot higher. Now, just to add more fuel to the WTF mix, Shane doubled down again this morning – with more data. This time on the Elite Drivo trainer. In that test he saw similar results to my Kinetic test done late last night – the power meters were happy. His Elite Drivo near perfectly matched the ROTOR 2INpower for the majority of the ride. There were a few cases where on the shorter sprints the 2INpower overshoots slightly, but it’s pretty minor and goes back to my existing statements on trying to quantify 1-second power for max sprints. With the indoor tests showing the ROTOR either good or slightly high, let’s head outdoors. That enables us to swap the Tacx NEO for the PowerTap G3 hub, although that’s equally as trusty. The file below is from a roughly 2-hour ride out to the countryside and back. It contains lots of stop and go at the start, some pretty rough roads along the way (cobblestones), and more on the return. It’s a good mix of terrain to test with. So in general, the three units are actually pretty close throughout much of the ride, usually within 10w or so between 200w and 300w. Thus in many ways, this is much better than the indoor rides. But if I go down to 0-seconds of smoothing, I get pretty darn close (about a max 20w difference on 745w between the units – or a mere 2.6%, well within the margin of error of two units each at +/-2% + drivetrain losses). But you can see why I don’t like comparing 1-second maxes below – it comes down to a story of transmission and recording rates, rather than true maxes. Here you can see things generally look quite good. The PowerTap P1 does spike higher than the other two for max 1-second power, but it’s unclear at this point which unit is correct there. For everything under that, they’re all within a 1-2% of each other. Note that the above was a standing sprint. Let’s look at one last outdoor ride, this one about three hours long on varied terrain including city and country roads. In general, things are pretty good on this ride. The majority of the time the three units track very closely, usually within 10w at 300w+. I get slight differences in sprints between the units. Sometimes the P1 is slightly higher, sometimes the ROTOR is slightly higher. Never is the PowerTap G3 hub slightly higher. Although within a few percent. And in some cases, I get really perfect alignment, like this sprint here – all units within 3w at 717w. If I look at cadence on this ride, I see things are pretty consistent between the units. Some very slight differences on stops/starts, which is normal due to how different units track going from pedaling to zero (or vice versa). But otherwise very consistent. So where does that leave us? Well honestly, a little bit conflicted. Indoors I’m putting the ROTOR somewhere between either ‘Good’ or ‘A tiny bit high’, but if it’s high, it’s at most 1-2% higher than it should be, whereas again, in some cases it’s fine. Note that every single ride/test/workout has a calibration (zero offset) done prior to the ride, and in many cases about 10 minutes in. In all cases, the bike has been in that temperature situation for at least 10-15 minutes prior to the start of the ride. Outdoors I see actually better results, which is kinda funny – as that’s rarely the case. For the most part, the unit tracks well. I saw a few sprints (not many), where the ROTOR seems to slightly undercut the power on sprints, though just barely. As far as cadence goes, I’m just not seeing anything of concern there across any of the files. So all is good on that front. It’s the indoors being over that I can’t really get my head around. Maybe I’m nitpicking the data too much (though, without putting words into Shane’s mouth – I think he agrees it’s a bit high). Or maybe I could nitpick other data sets previously more. I’m not sure. Or maybe there’s something else I’m missing. I’ll let you decide. Speaking of files, here are all the raw files from these activities (plus more I didn’t show above). 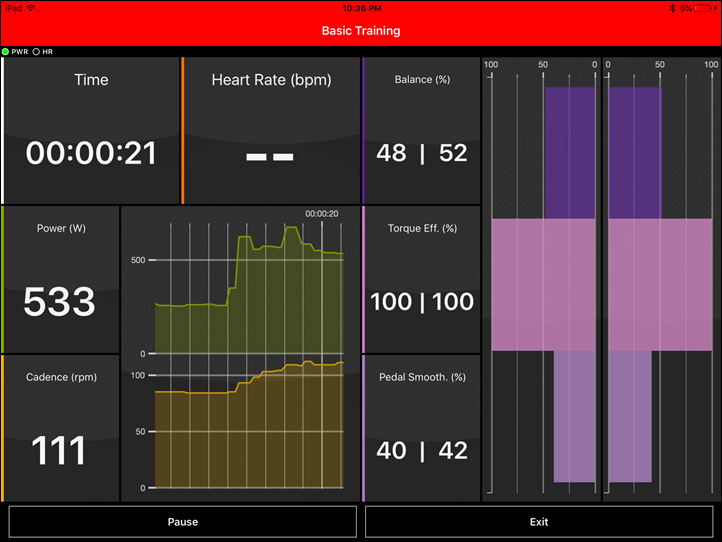 You can go into the DCR Analyzer and poke around at the various graphs (zoom in/etc…), as well as download the original .FIT files from each workout. 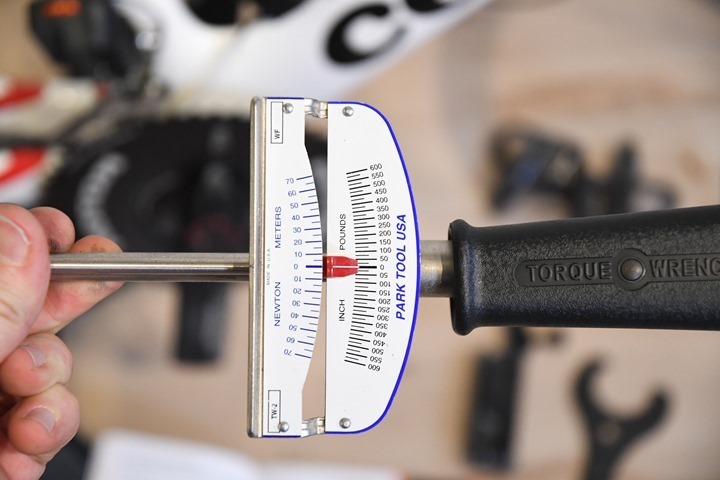 A) 4iiii Precision Dual Review: The post in my annual power meter guide didn’t cover the accuracy aspects of the newer left/right setup, so I didn’t dive into general recommendations. But as you saw in my in-depth review a few months ago, that’s solid. No issues recommending it, works well. B) WatTeam Gen2 Dual: You also saw this review a couple months or so ago, and it was mostly pretty good. The WatTeam re-introduced their $499USD dual left/right power meter this past winter. There were two quirks that I saw though, so you’ll want to check out that review to see if those impact you. C) Quarq DZero: I discussed this and included it within the post, but just in case you didn’t see my in-depth review, that’s located here. Phew – you made it to the end! So where do we stand? 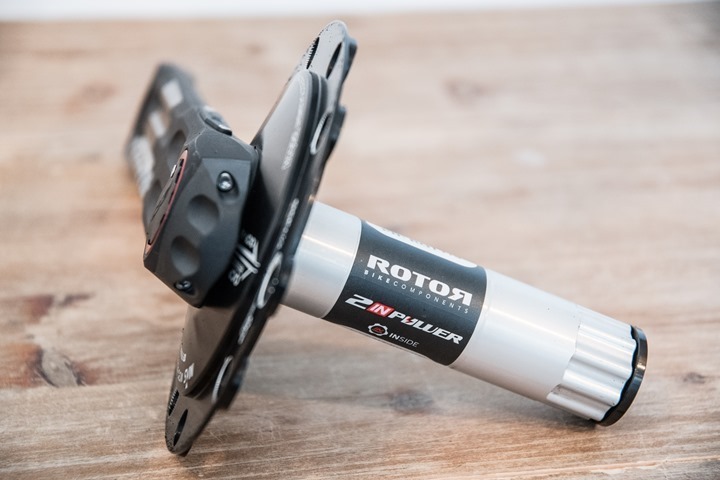 Well, ROTOR brings to the table a unique offering in the 2INpower that’s a bit different than other power meters on the market. Sure it does total power and left/right balance, and all that jazz, but it also is one of the few power meters to support elliptical chainrings (non-round rings). It’s also one of the few power meters to support not just displaying, but actually recording all of the extra force metrics seen in their app (including GPS data). And finally, it’s one of the few power meters using a rechargeable battery, which some folks prefer. On the accuracy front, things were solid outdoors, with no issues through any number of situations – including rough terrain/cobbles. Indoors, I believe I’m still seeing (very) slight highness in some cases (but not all). ROTOR would argue that it’s no different than I’ve seen before in other reviews, and I agree with them in some data sets (but not all). As I noted earlier, perhaps I’m nitpicking it too much. 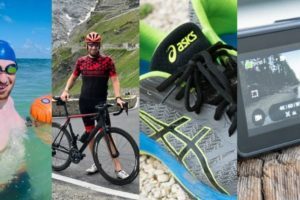 And one thing that I often talk about is that there’s the reality of power meters simply producing slight differences that I can’t explain – no matter the brand or model. And that’s something that often gets overlooked. Being one of the few people on earth that for years has been riding 3-4 different power meters on every single ride and recording all that data, I see some unexplainable stuff over time. Usually nothing big, just minor quirks. A percent here, a percent there – rarely with any reason. Ordering might be different one day versus another. Sometimes I nitpick it more than others. But that’s the reality of power meters today – for all brands (and I’ve ridden or own them all). Can I train by the 2INpower? Absolutely. Is it better than left-only power meters? Definitely. With that – thanks for reading! Feel free to drop any questions below – I’d be happy to try and get them answered. My unit (172.5) without rings was 645g. 831g with 52/36 rings. Yup, part of the challenge with determining which one is right. Generally I get a pretty good idea, but sometimes it’s tricky. (Which, as a side note since some will say something about the important of being able to do a static load test – that actually has nothing to do with this. Static load tests are easy to pass. It’s getting it right out on the road, or even on a trainer in this case, that’s trickier). Yeah, that’s the next best option. Though, it’s still limited in that it can’t deliver bumps/rough roads, which I find is still the leading cause of power meter accuracy issues today (next is temperature shift). I like to think that Rotor customer service is pretty good, but then again, I’m the one answering the phones at Rotor America. If you ever have any questions, please feel free to give us a call at 801 393 4822. I would say that ROTOR’s backend/engineering team has been the fastest out there in terms of responding to my questions here and giving detailed and thoughtful responses. I can only say good things about Rotor’s customer service. I have one of the original Rotor Power units that failed. I’d lost my receipt, but luckily the box still had the card in it when the unit was produced. It was very close to the warranty period (probably a little over). Rotor replaced it with an In Power unit and also sent me some Qrings and a BB as well in replacement as the 2IN wasn’t out. Personally can’t fault it, or the team at Saddleback who helped out. I’ll second that – Aaron rocks. 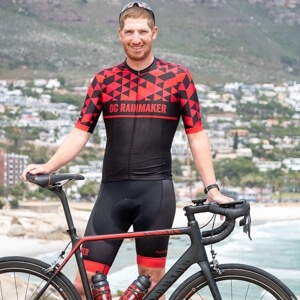 He knows just about every bottom bracket combination for any bike in the world, and can match rings to riders like a pro at a dating service. Like Ray and others, I’ve tested and tried a LOT of different PM’s, and beta’d several. I’m riding an InPower now and have a 2InPower on my P3. I am very, very, happy. Most importantly, if anyone has ever questioned the validity of Q or QXL rings and positioning, then spend some time with the 2InPower. It quantifies the location for the OCP, and then, after installation, you can literally quantify the delta. For my clients and myself, that has come out to roughly 3.8% on Q’s and ALMOST 8% on QXL’s!! This is the ultimate system. Seriously. The app can even export to csv on an iphone, which I never thought possible before. Que Cool!!! 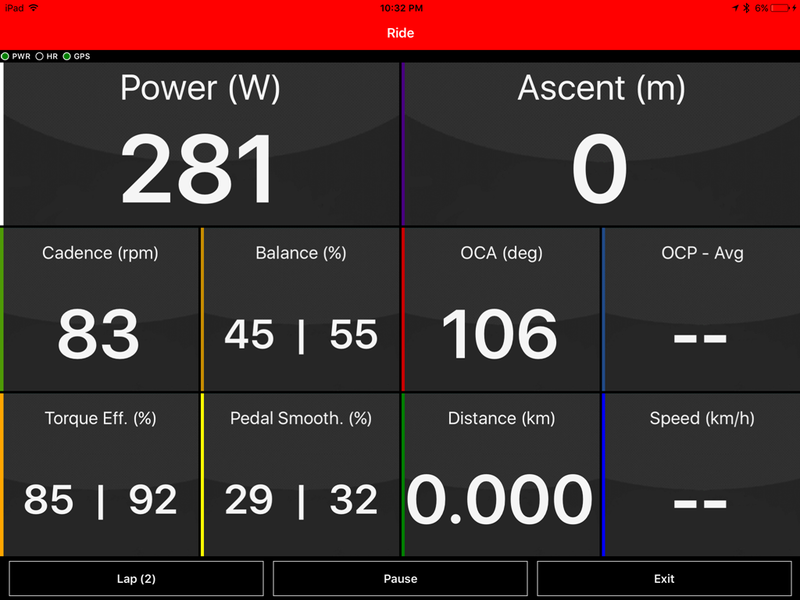 Rode today and measured with ROTOR Power iPhone app … how do I export to CSV or find the FIT file on iTunes? Nat – try this: connect your iPhone to your computer and open iTunes. Select the Rotor app program to get access to export your recorded data in .fit and .csv. It’s not the easiest thing to find, but the files will be in there. As Richard has perfectly explained, you just need to connect your iPhone to your computer and extract the files via iTunes following the sequence: phone icon – Apps – Scroll down and click on the ROTOR Power icon – select and export the recorded files. What exactly did you mean by this? 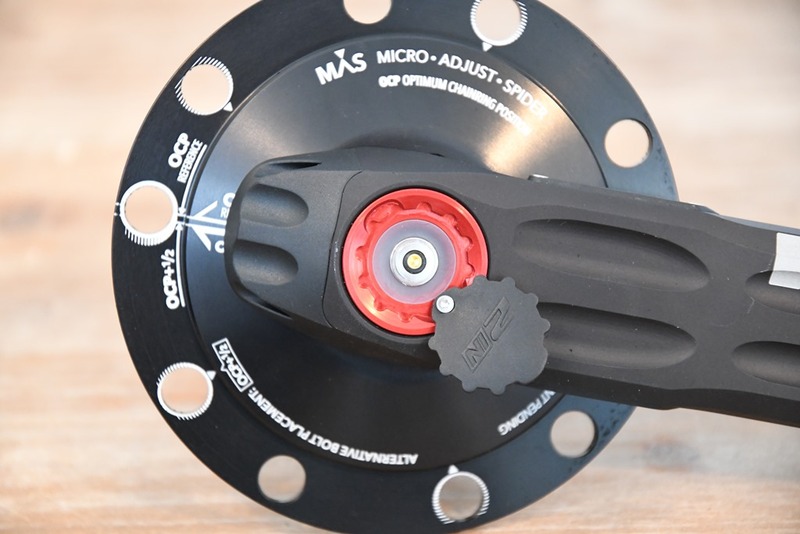 Meaning that the PowerTap G3 is always the lowest of the bunch – as it should be since it’s furthest from the rider’s output and further down the drivetrain. Though I agree, that the wording is confusing in that second sentence. I’ll try and tweak. 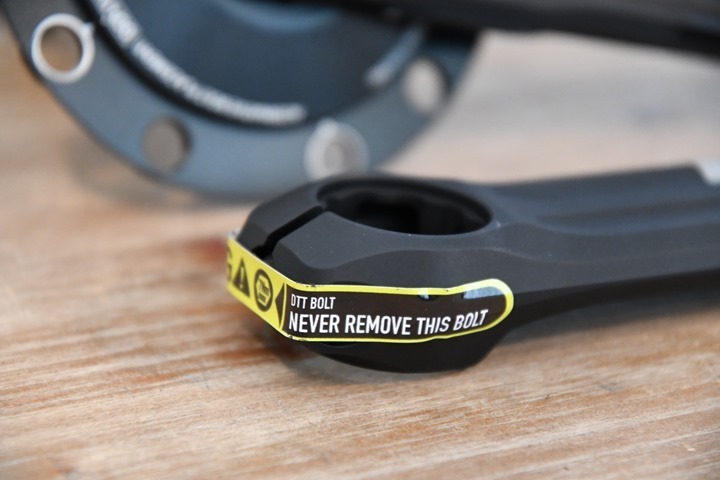 Never is the PowerTap G3 hub slightly higher. Although always within a few percent. The PowerTap P1 “probably” measure pedal axle deflection, and Rotor’s 2INpower measures crankarm deflection (right side) and axle torsion (left side), they are all basically measing deflection of the same mechanical assembly, and no friction losses occur between these measurement points. So they should measure the same. Now if you compared with a hub-based power meter, yes, *that* should measure a bit lower than at the cranks/spider/pedal location. But as your test demonstrates, the scatter in accuracy between units is larger than the mech losses. From a pure physics standpoint, there is some minor losses with the bending of the crank arm. But I agree it’s tiny/virtually unmeasurable. It’s why I say that they’re basically a wash between those points, but that technically speaking the pedal would measure higher if anything. Price/Availability? Did I miss this? Fwiw – Clever Training should be stocking it soonish. Soooo. Am I the only Speed Concept owner who’s been snubbed by the lack of BB90 compatability? I was talking with the rep and ready to pull the trigger…. Ah well. DFour it is! The reason why we are not compatible with BB90 is that we place all the electronics inside the spindle, and there’s not enough room in a 24 mm axle to harbor all the components (mainly motherboard and battery). 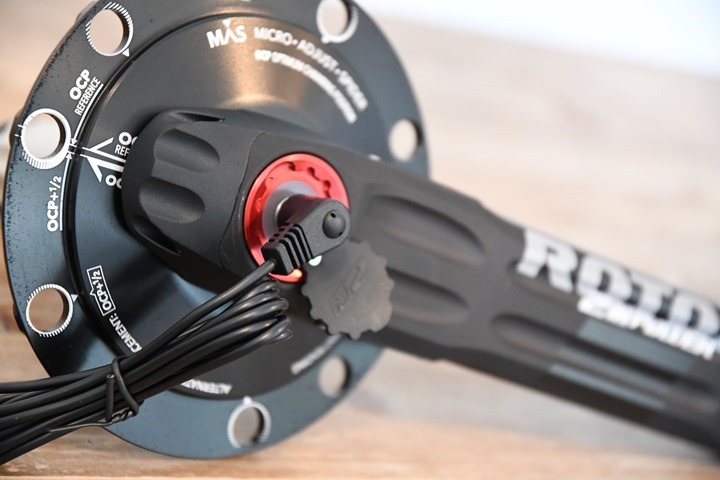 We believe that there are many benefits from having everything inside the axle: the power meter is protected from shocks, dust and water, and all the extra weight is centered. How is cadence (velocity) measurement handled? 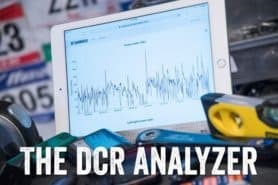 Do you have a chart comparing weights of power meter setups? We use accelerometers for cadence measurement. 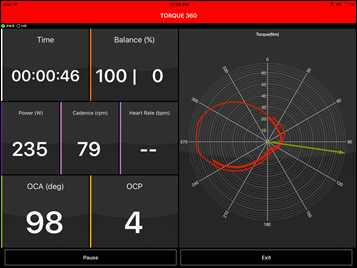 Accelerometers allow us to know the position of the cranks multiple times per revolution, which is key for us to be able to show the TORQUE 360 graph, where you can see pedal stroke in real time and the OCA/OCP values for Q-Rings positioning. Thanks for your review. I just placed my order for a 2INPower crank today. I’m a Q-ring user, and plan to use crank data with Rotor’s smartphone app to tweak (or validate) my OCP (optimum chainring position). I may learn that OCP for a hilly road race is different than OCP for a flat time trial. The OCP validation/checking/whatever you’d call it in their software is pretty neat. I’ll cover this in my follow up video/review/look into my 2INpower unit. I encourage you to check your OCP in different conditions. Usually the body position in a TT bike is a lot more forward than in a road bike, thus rotating the “peanut” shape of the pedal stroke downward, which will lead to a higher OCP number in the TT bike than in the road bike. Anyway, we all have different pedaling styles, so even if that’s the general rule, it is not always the case. I’m looking forward to seeing Shane’s review about it. I have two 2Inpowers (road and TT bikes) and that app is pretty cool and in my case did suggest I move to OCP 4 on the TT bike from OCP 3. Felt good, numbers good. It would seem that the 2Inpower does not transmit both Ant + and Bluetooth (at least when using the app). 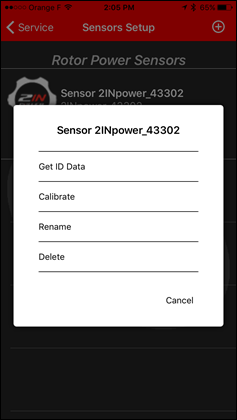 Normally my Garmin 520 syncs up with the 2Inpower signal very well – I presume through Ant+, but since the 520 and 2Inpower are both dual Ant+/Bluetooth I am not sure – but when using the app on my iPhone, I get data on the app but not on my 520. So if you want to use the app on a ride to do things like determine your best OCP, you won’t get power data in your 520 (or other head unit). Maybe NBD, but when you are used to having PM data on all your rides, it feels odd to upload your ride to Strava (or other sites) and not have power data. Thanks, Robert. The limitation of syncing to a single device (head unit or smart phone) seems OK to me. Once I tweak OCP, I won’t likely adjust it again on the same bike (unless I change something like seat or cleat position). I really like the idea of OCP adjustment based on actual ride data rather than “feel”. I suspect other Q-ring users will also find this a compelling reason to purchase Rotor 2INPower. For what it’s worth, I’ve had multiple versions of Powertap, SRM, Quarq and Power2Max PMs (though in fairness, I have yet to actually ride my Power2Max NG because it’s on my CX/backup road bike) and so far the 2Inpower is my favorite. Can you expand on this? Why do you prefer the 2INpower? The 2INpower transmits ANT+ and Bluetooth at the same time, but only if both are connected to the same data rate mode. Let me explain it a bit better. 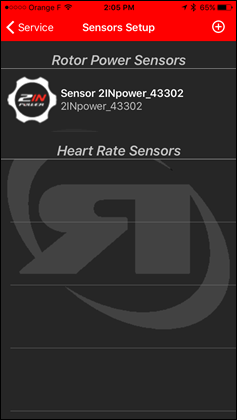 The 2INpower has two different modes, the standard one, in which it sends data to the receivers at 4 Hz, and the fast/advanced/TORQUE 360 mode, in which we use a propietary protocol that sends data to the receivers at 50 Hz. 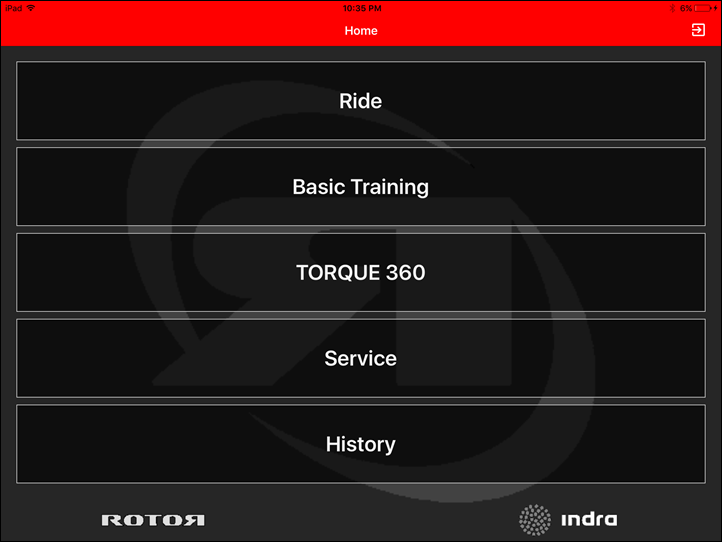 The app has three different training options: Ride and Basic training, which both work at 4 Hz, and TORQUE 360, which works at 50 Hz. You can then connect the 2INpower to the app and to a third party computer at the same time when using the standard 4 Hz modes, When using the TORQUE 360 mode, the problem is not the dual ANT+/Bluetooth transmission, but the different data rates. I hope that’s useful information. If you have any further questions, our tech service team is happy to help you at techservice@rotorbike.com. Great review Ray! Still hoping for the new Power2max NG in depth review. 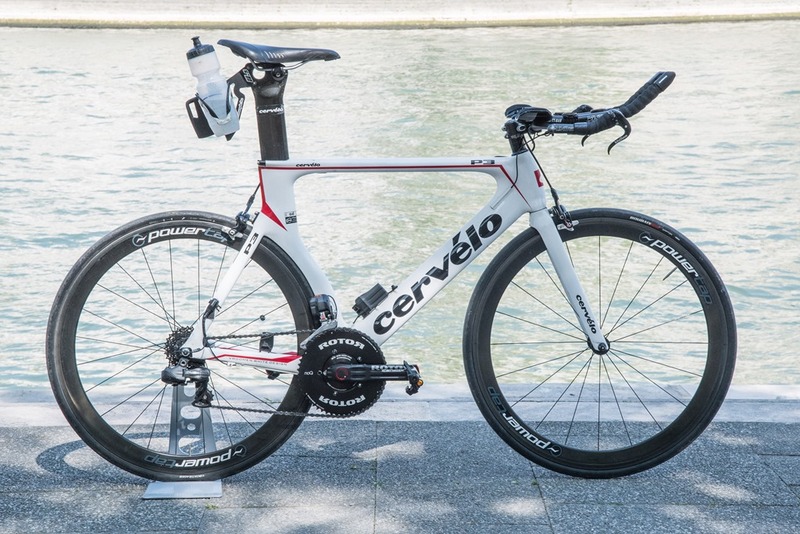 Any issues with getting a solid signal with a “tri” watch while out on the aero bars? With my P3 and the original dual Rotor Power (2014 vintage) the signal invariably cuts out there but is OK if put the watch in top tube bag or to an Edge just in front of the base bar. I used it a few times with a Fenix 3 and FR935, and didn’t see any issues. Though with any of the aerobar type power meter dropouts, sometimes it’s just more about body/bike position than anything. As you will recall being 1.95m tall doesn’t help in this regard either! Signal in new generation powermeters of Rotor is way better than the old ones and reaches a couple of meters. Great review. I’ve been using the power meter since last July and I must say I like it. Regarding your comment on indoor training I had the same impression on my Tacx Neo, however last week I updated the Rotor firmware (a bit of pain process since you need to use the desktop app), performed the calibration and I did tempo intervals above 90rpm. I found that Rotor was reading a bit higher on recovery range (100-140w), but within 200w it was perfectly fine. If needed I should have both the Garmin file (tracking Rotor) and Trainer road export (tcx) tracking the Neo. My take away? They might have fixed something on the firmware upgrade. Did you manage to check with them? Great review and here’s some thoughts about the inaccuracies when used on a trainer. Where are the strain gauges located in the 2INpower? If they are located in the crank arms this is a valid explanation. But if they are in the spindle it might not work as a valid explanation. When clamped in a “stiff” trainer you can put force in axial direction of the pedal axle, this won’t trigger the strain gauges of the P1 pedal but this force will generate a bending moment of the crank arm that can be picked up by the crank arm strain gauges. This bending moment will be added to the second bending moment coming from the pedal force in the correct direction that provides forward motion. When you are on a rock and roll trainer or out doors this force parallel to the pedal axle will be close to zero since this force will flip the bike over, hence the force measured buy the 2INpower will be less in these situations. According to the specs on Rotor’s web page, the strain gauges are in the crank for the right side, and in the spindle for the left side. Your theory could still work… half. We have two Rotor INpower’s on two bikes and both of them track nearly 10% higher than the NEO when used on Zwift. Calibrating time and again doesn’t help anything either. Our chainrings are oval though, wonder if that’s part of the problem..
sorry if someone pointed that out already but I did not go through the comments. I understand in the last part you meant “…between the Tacx and the 2INpower”, didn’t you? Actually, it should read “…but that wouldn’t”…meaning that the P1 and 2INpower should read very closely. Tweaked! Thx Ray, nice and honest review as usual. Being a power2max user I’m always glad that I never have to calibrate it as it has perfect temp compensation built in. Do powermeters that need calibration drift in changing weather conditions? Also, could you please do a review of the power2max NG some time? As it also has a rechargeable battery like the Rotor2inpower. Both 2INpower and INpower give accurate and stable power measurements independently of changes in temperature, so it is not necessary to calibrate them to compensate for temperature changes. The fact that the strain gauges are situated opposite of each other assures that temperature changes are auto-compensated. We have tested our power meters between -20 ºC and +70 ºC seeing no significant variation in power readings for the entire range. To echo what Irene said, in my testing I saw *zero* issues that I would account to temperature drift. And I often try and dork with units and take them outside quickly and see what happens. No concerns here. That said, i do recommend doing a zero offset regularly, merely just to know if your unit is having issues. Seeing significant shifts in the zero offset number is often an indicator something may need a second look at on your power meter (of any brand). As for the Power2Max NG unit review, it should be going on my road bike either tomorrow or the weekend. It’ll be the next power meter review I release, likely towards the end of the month. You don’t have to calibrate/zero offset your power2max because it auto zeros itself every time you stop pedaling for more than 3 seconds. It works well outdoors but may cause issues while riding on the turbo where breaks in pedaling are less frequent or not present at all. Almost every power meter requires doing zero offset before ride. Many power meters have also additional software temperature compensation alongside zero offset/hardware compensation. Thx for all the replies here, great to get direct feedback from Rotor and Ray. Good to know about the temp non-issue! Btw, I love my Rotor 3D+ cranks and rings I use with my p2m 😉 The 2inpower and p2m NG seem very close contenders then! Looking forward to upcoming reviews. I gather there is no way to put a Shimano chainring on this power meter like can be done with the DZero? Is that correct? It’s 110 BCD, which means you can’t fit standard (130 BCD) chainrings, but I would assume compact, 110 BCD rings would fit. Shimano will certainly tell you that the bike frame will melt if you do this, however. They always do. I think Louis might be referring to the newer Shimano design I.E. 5800, 6800, 9000, etc. series. Although these are 110 BCD, they are 4 armed versus most being 5 arm cranks. I would also like to know this. Quarry offers this, but are different models for these specific chainrings. Exactly. I like Shimano chainrings and Quarq has a model that accepts Shimano chainrings. Absent being able to do this with the ROTOR 2INpower my decision is made for me. As Josh said, unfortunately our spider has 5 arms, so it is not compatible with the 4 bolt system of the Shimano chainrings. 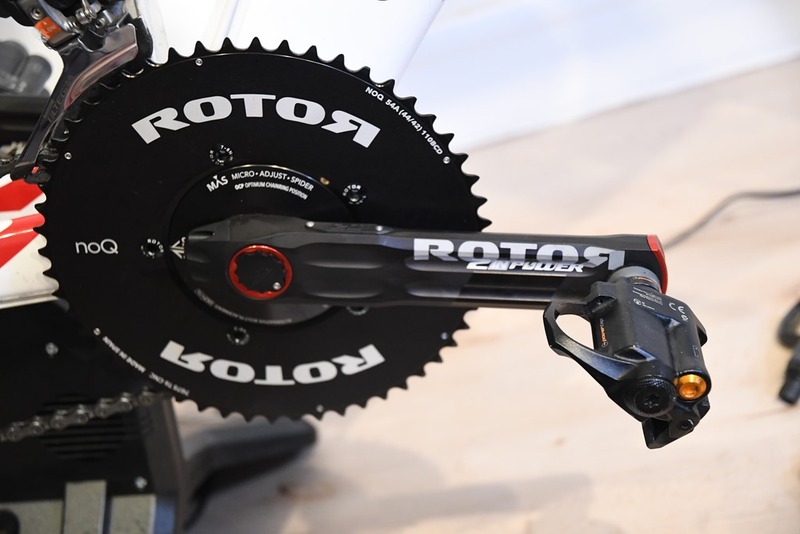 Of course I would encourage you to give the ROTOR rings a try if you like the 2INpower. Are ROTOR rings the only compatible chainring option? I very much like the aesthetics and features/performance of your crankset, but would prefer the look of something along the lines of Praxis or Wickwerks chainrings. I’m glad that you like our power meter. Both Praxis and Wickwerks have 110 BCD chainrings with the 5 bolt system, so they are fully compatible with the 2INpower and the rest of our cranks. 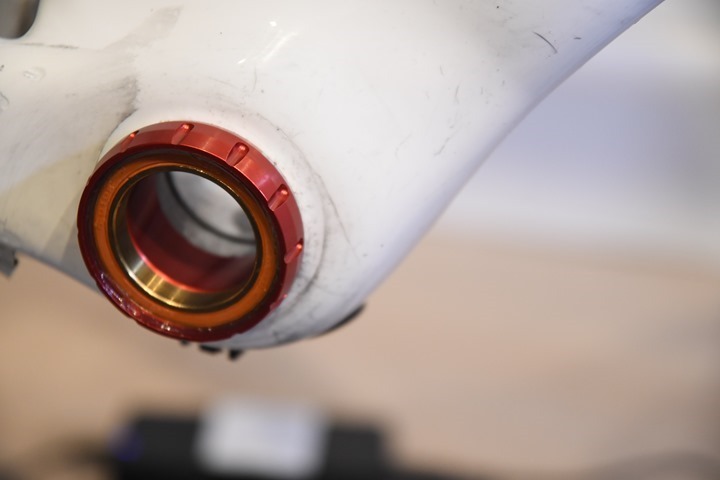 If you have any other question about compatibilities, you can contact our tech service guys at techservice@rotorbike.com. They will be more than happy to help you. I’m using Shimano 6700 chainrings with no issues. Yes these are older but seem to work fine. Any support for subcompact chainrings? Either 46/30T or 48/32T? We also have a 46/30T spider-ring, but then you would need to remove the spider from the 2INpower and replace it with the spider-ring. Thanks, Irene, it sounds promising, I’ll follow up with the tech support email this week. Irene — how hard would it be to switch between the two? If I wanted 50-34 for normal riding but had the 46-30 if I was traveling somewhere really hilly? Honestly, I wouldn’t recommend changing the spider. It is something that can be done if there is a real need (we do it for 2INpower vs SRM comparison, for instance), but it is not easy and you need to make sure that it is completely aligned after installation, so changing it back and forth is not recommended. In your case, if you just want to switch rings for a few days and then go back to your usual preference, I would better suggest to go for a 46/34T or a 44/34T combination. Irene — thanks for the honest response. I am intrigued by these new ultra compact (?) ratios as I am old, out of shape and live near some reasonably rough hills. Too bad it isn’t a simple swap. I’m assuming it is something that my shop could do for me if I wanted to try it? Sure that’s something your shop could try to do for you. They have to clean the surface of the attachment properly after unistalling the old spider and before installing the new spider-ring, and then make sure that the spider-ring is completely aligned. The process requires a tool to uninstall the spider. We sell it via our dealers, and other manufactures as Power2Max sell it as well, so it should be quite easy to find. A question on installation and then removal. I was careful to undo the screw on the non-drive side only 1.5 times as instructed however it was an extremely tight fit onto the spindle. I had to tap it on with a rubber mallet…it would not push onto the spindle. Is this normal? I now have to remove the PM to put it on another bike….on removal how do I know how many times to undo the screw on the non-drive side arm so as not to break it off? It is not normal that you had to push the non-drive side arm onto the spindle with a rubber mallet. We recommend to undo the screw 1.5 times to be in the safe part, but you could actually undo the screw a bit more if needed. In order to remove the cranks from your bike, you should undo the screw until it gets to a dead spot (you’ll fell there’s a point in which there’s no resistance), and keep undoing it 1.5 to 2 more turns. Just for you not to be so concerned about breaking the screw, it is not so easy, and you’ll definitely feel that you need to apply a lot more force than normal to undo the screw when you are going to break it. Please contact us at techservice@rotorbike.com if you need any further help. Would the 2inpower be OK to use in cyclocross? Can you use a QCX-1 ‘Q-RING’ with the 2inpower? Yes, it would be ok to use the 2INpower in cyclocross. You can use a QCX1 ring with the 2INpower installing it as if it were an outer ring but with shorter nuts. 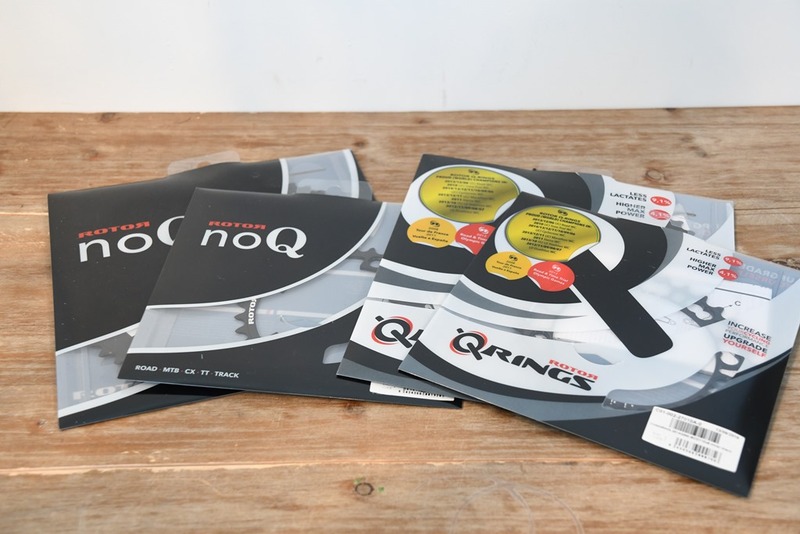 The QCX1 rings have been designed considering this option. I have a 2INpower and am seeing the same inaccuracy described in the review. At 100w my Taxc Neo and Quarq DZero match spot on but the 2INpower is 10w higher, so out by 10% which is greater than claimed tolerance. Strange thing is that for a while the 2INpower was matching spot on; I got it in February and it was fine for a month or so then all of a sudden started over reporting. I’ve also checked against an Elite Drivo and got the same error. I have submitted a support request to Rotor 2-days ago but have heard nothing as yet. First off, for me, I have not paid too much attention at how close my 2Inpower and NEO are at 100W because (for me) that’s not an intensity that means much to me. Most of my efforts on the NEO are between 250W-350W. The point is, you should always expect a crank-based PM to report a higher output than your NEO, if both are truly accurate. On a side note, I *think* my NEO runs a little “hot” but in my case this is great for me, as I get typical differences of 0-2W when doing sustained intervals on the NEO. Since they are measuring power in different spots, the output should not be (essentially) the same, but in my case it is. And this makes my training data essentially consistent across indoor and outdoor rides. Which for me would be preferable than having my NEO report true data reflecting drivetrain losses, which would mean that for training purposes, my indoor NEO rides would not be comparable to my outdoor rides where I have only 2Inpower data. Hi, of course you’re welcome to draw your own conclusions, but I’m afraid that for me the data shows that the 2Inpower is over reporting. Still awaiting Rotor’s response. First of all, sorry for the late reply. The 2INpower reads power from the right crank and the spindle, so it is not affected by the drivetrain losses, while the trainers are. Considering this, it is normal that your 2INpower reads higher power numbers than your trainer. Even though, 10% sounds a bit too much, and more than that, it sounds weird that the two systems were spot on one month ago but not anymore. I would like to check the .fit files from a couple of rides when the NEO and the 2INpower were measuring the same, and also when the two differ from each other. I think my colleagues from tech service have already replied to you, so you can send the files to them and I’ll make sure to analyse those files myself. Ultimately I returned the cranks and got a refund. Rotor have been responsive in their attempts to fix things; they looked at some power files and decided it was down to drive train losses. I then checked things over on my bike and found that the non-drive side bb bearing wasn’t 100% smooth so changed the bearing. The power delta then went away. Unfortunately it then returned. I really couldn’t see how drive-train losses could account for the delta with new bb bearings, a well maintained dura ace chain and gearing selected for minimal cross-chaining so I returned the cranks to the retailer as faulty, expecting them to be sent to the distributor for inspection. The retailer issued me refund. I’m assuming that the cranks were checked over at the distributor and a fault was found. I’m now using a power2max type-S and am very happy with it – it doesn’t show the same delta as the 2Inpower did; readings between the Type-S and the Tacx Neo are within the stated combined tolerances for both devices. I wonder how does the pedal stroke counter-action counts in the final power calculation? This is something which isn’t “visible” on spider and further conventional points of power measure, but on the cranks and pedals you got options. Thus the pedal stroke efficiency can affect data variation, this is something which may vary indoor (more efficient) vs outdoor samples. 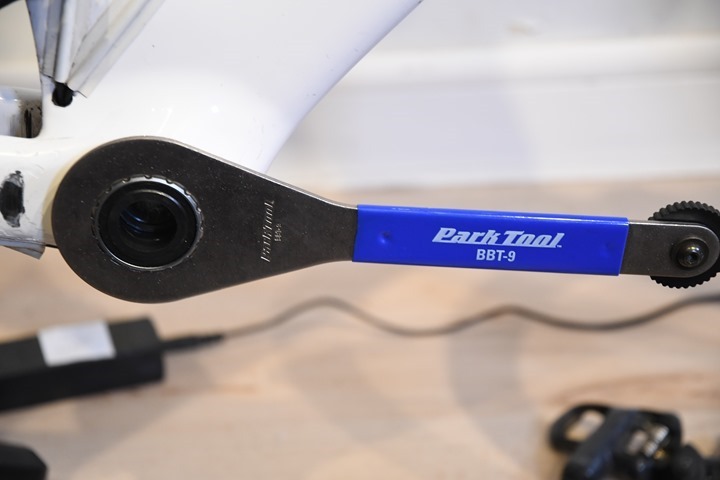 Pedal or crank arm based power meters shouldn’t add ineffective torque to total power output. It is filtered out. Isn’t that where “torque effectiveness” metric comes from? Why not? I would argue the work from the physiological point of view has been done. Now it’s just how efficiently it can be transferred. Since we have a ROTOR representative on the thread I thought that would be an opportunity to clarify what exactly do we measure. Total power should not be affected by the visibility or not of the force applied during the rebound. 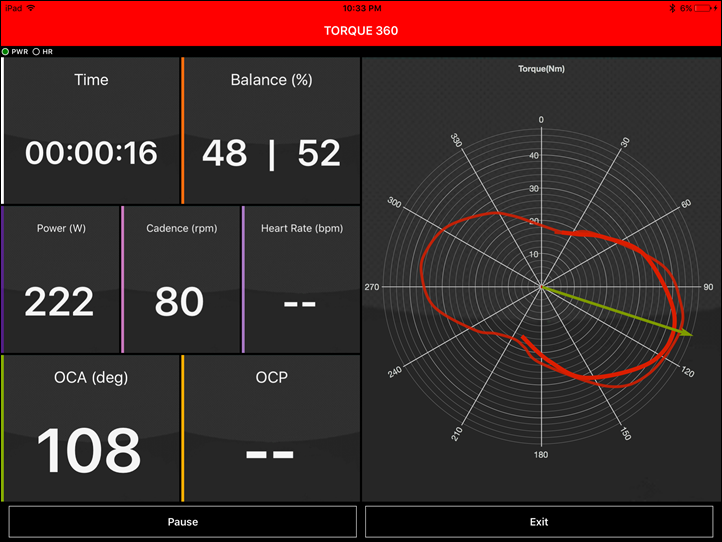 The pedal and crank-based power meters have the advantage (compared to spider or hub-based power meters) of measuring power independently for each leg, so they are able to know what’s happening during the down-stroke and during the up-stroke, thus being able to give torque effectiveness* data. Total power is just the sum of what’s done with the two legs at the same time, no matter if they are pulling or pushing, or if the efficiency is high or low, so the total power read by the spider/hub-based power meters should be the same as the total power read by the pedal/crank-based power meters (not considering drivetrain losses here). When, during the up-stroke, the produced power is negative (because we are not pulling but instead we are leaving the dead weight of the leg over the pedal), that negative power is affecting total power, and that is the same for every power meter. The difference between one type and another is that some types give torque-effectiveness data to know how much power you’ve lost during that period, while others don’t give that information. Regarding accuracy, there are a lot of variables that we have to take into account. 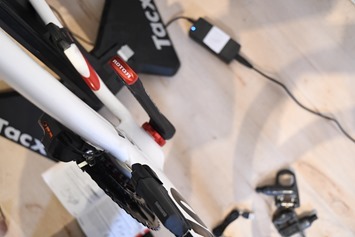 Hub-based power meters and trainers are affected by drivetrain losses, while pedal, crank and spider-based power meters are not so affected by them. Pedal-based power meters are affected by torsion, and indoor riding conditions, where the degrees of freedom are restricted compared to outdoor, can affect in a way the torsion of the pedals, giving a less accurate power measurement (I’m not saying that’s always happening, I’m just saying that that could happen depending on how the factory calibration is performed). Temperature is another variable that manufacturers usually need to consider when calibrating in order to compensate measurement variations, and it affects differently to each power meter and manufacturer depending on how the strain gauges are situated. What I’m trying to say is that all the power meters have their pros and cons, and it is always difficult to judge which is the best, because it is possible that there is no best. Depending on the situation, the rider or the priorities, one could choose a different one in each case. *Torque effectiveness is the ratio between the total power produced by one leg in a complete cycle and the positive power produced by that same leg during that same cycle. This means that the more you pull during the up-stroke, the closer to get to 100%. When riding indoors, as pedaling style is usually more efficient than outdoors, torque effectiveness values should be higher (as a general rule, then there are as many pedal strokes as riders). Negative power indeed comes from the counter stroke, but you need to do the calculations considering a complete pedal cycle. Imagine a complete pedal cycle where in the first half the right leg pushes 40 Nm downstroke while the left leg pushes -10 Nm at the same time, and then in the other half of the cycle the left leg pushes 40 Nm downstroke while the right leg pushes -6 Nm at the same time. Total power at average torque of 32 Nm ((30+34)/2 = 32) would be (considering 60 rpm) 200.96 W, and that would be the total power registered by every power meter, no matter if they are crank or spider-based. The only difference is that the spider-based power meter only reads 30 Nm during the first half and 34 Nm during the second half, while the crank-based power meter receives all the information. – Torque effectiveness for the left leg is 30/40 = 75%; torque effectiveness for the right leg is 34/40 = 85%. – Balance is 47%-53% (left-right). This comes from the following calculation: total right is 40-6 = 34 Nm; total left is 40-10 = 30 Nm; left balance is 30/64 = 47%, right balance is 100-47 = 53%. Regarding balance, some spider-based power meters estimate balance, but they do it considering that everything that has been done during the first half of the pedal stroke corresponds to just one leg and everything that has been done during the second half of the stroke corresponds to the other leg. In that situation, and taking the example before, they consider that during the frist half of the cycle, all the work was done by the right leg, so the right leg pushed 40-10 = 30 Nm, while during the second half of the cycle the left leg pushed 40-6 = 34 Nm. In such case, they would say that balance is 53%-47% (left-right), which is exactly the opposite from what it actually is. This only happens when, like in the example, the difference between the two legs comes from the counter stroke. If the difference in balance between the legs comes from the downstroke, then the estimated balance given by the spider-based power meters would be pretty accurate. I hope the explanation clarifies a bit how the different power meters work. Thank you for this detailed review! Disappointed that it reports a higher indoor wattage than expected. I was looking at the 2inpower as an addition to my powertap g3 because I use and like my q-rings. This inconsistency between indoor and outdoor would make it more difficult to train with in my opinion. Even if the 2inpower has a function similar to the slope adjustment function of Quarq DZero to lower the reported wattage by a couple of percent it would not help with the indoor/outdoor difference. Then again, I ride rollers indoor so maybe that gets it closer to outdoor riding.. Thanks for doing this review and indeed for all of the back up comments, very insightful. I just have a quick question to you both if I may. 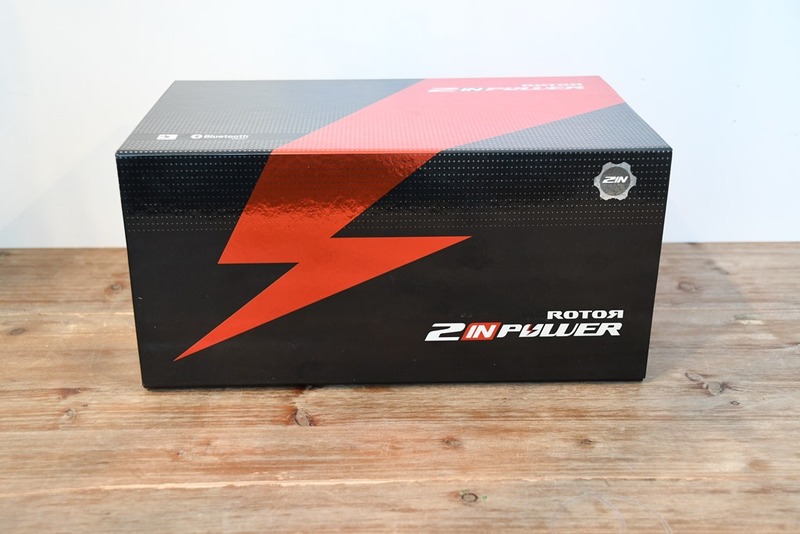 I have a Rotor 2InPower system and it has been really great. But, I’m seeing something a little “different” with regards to cadence when I’m riding. Basically, when viewing the cadence on my Garmin Edge 520 during a ride the cadence seems to “bounce” around a little when riding over very rough roads. Now, this isn’t anything too major. Basically, as you will know, the Garmin Edge display updates real time cadence on the display every second. When riding over the aforementioned rough surfaces with the same perceived cadence the number seems to flick around. This pattern may look a little like: 80, 82, 86, 80, 78, 80, 82… (each second) despite me not really changing my cadence. I have come across from using an SRM which, as you will know, measures cadence differently, once per revolution via a magnet rather than the accelerometer system incorporated by the 2InPower. So, is what I am seeing just a simple, minor trait of how accelerometer based power meters measure cadence, or is their something going slightly wrong somewhere. Any help/experience that either of you may have would be very much appreciated. Thanks for your detailed feedback. I think that the jumpiness you are seeing is normal. As you say, SRM measures cadence with a magnet and 2INpower does it with an accelerometer, so the fact that they measure cadence in a different way can have a small effect in the values you see second by second, even if that shouldn’t be reflected in the average values. But it is not only about the way each of them measure cadence, it is also about some other things like filtering. With the 2INpower we’ve played with the filters so that the response of the power meter to changes in cadence and power is quite fast, while considering the effect of rough roads at the same time to avoid having really high and unreal peaks or data losses. We’ve performed lab tests simulating the vibration effect of the cobblestones and have ridden in the cobbles a number of times before determining the right filters we should use, and I’m quite confident that cadence numbers are very reliable. Nevertheless, we are always testing new things and trying to improve our products, so I’m taking note of your feedback and will continue to test rough road conditions just in case we can improve the 2INpower in that respect. Are you sure quarq doesnt support oval rings? On the web many people say they don’t and many say they do lol..
Great information! Searching for that. I have a new unmounted Quark Dzero GXP and a new Reset Racing GXP BB at home, ready for installing. I am riding Q-Rings… Should I sell the Dzero and jump on 2inpower? I am already using two P2M Type S with Q-Rings. Power2max say Q-Rings are supported, because of higher sampling rate in comparison to SRM for example. I want to stay with Quarq Dzero, because it is nearly 100g lighter and it is (all day) weightweenie project. 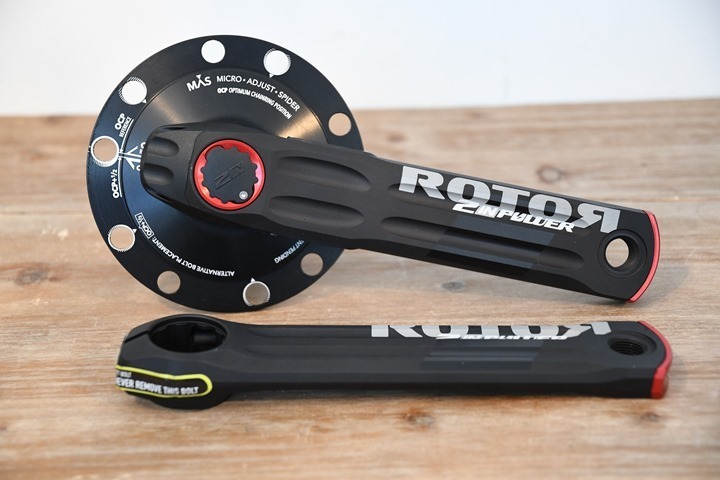 Ray – Are you going to update your comparison chart with Quarq DZero and Rotor 2INPower? I find that tool very useful in sorting out my options. Yup – have both tabs open right now on my browser to get done by tomorrow. 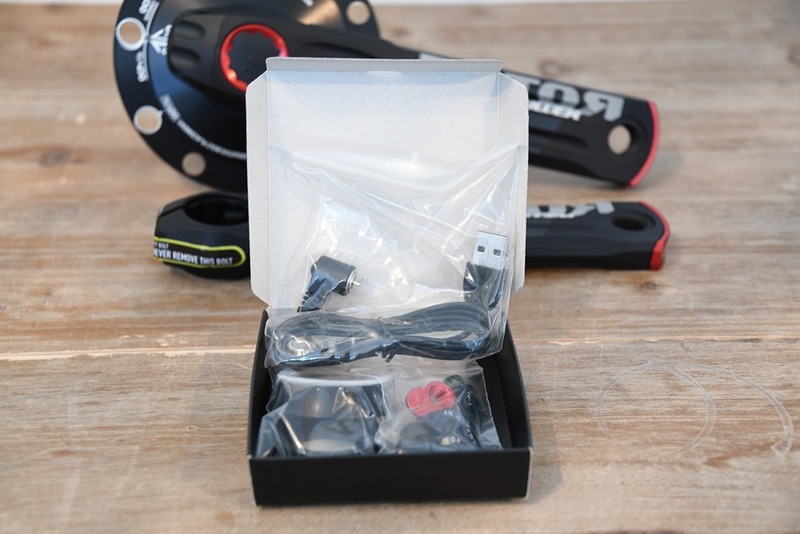 We can’t forget that this is one of the few companies that still sells a mountain bike power meter, in an InPower setup. Having owned the first Ptap mtb hub ever, this information could be priceless for a XC or Enduro racer. Can someone help me…I have two bikes with two different BB standards. One with ITA BB and one with a BB30. Per the Rotor website the 2INPower is compatible with both. Therefore, can I swap it between the bikes (assuming I also change the chainrings each time as one is Campy and the other SRAM)?? Sure you can swap it between the bikes if the BBs are ITA30 and BB30. You only need to be careful putting the proper spacers in each case. If you have any other question regarding compatibilities, please contact our tech service guys at techservice@rotorbike.com. They’ll be happy to help you. Sorry I forgot to say that the Campy rings are not compatible with the 2INpower. The 2INpower is 110 BCD while the Campy rings have a double BCD (112/145 BCD if I’m not wrong). No problem with the SRAM chainrings. Thanks Irene. I’ll definitely contact them to make sure regarding spacers etc. My campy chainrings (SuperRecord 10s) are 5 bolt 110BCD so I think they’ll be ok? Yes, no problem with the rings then. First of all, I must say I have waited for long this review (but already bought it before this)! 🙂 Always glad to see this kind of detailed and fruitful contents- Thanks so much. I have been using 2inpower without any issue at all so far then just couple of hours ago, lowered saddle for new position then re-calibrate. Calibration number was 49 which is between +200 ~ -200 (even before this, it was 48). With this number, I rode on roller for testing new position…all the data including power / left, right balance, smoothness, effectives are all transferred well. However, OCA now shows it is over +200 thus OCP can’t be decided. And also my pedal is now shown very terrible. Definitely, before re-calibrating after lowering saddle, it was OCP 2~3 then just after calibration, it goes far. Saddle was lowered only 5mm so not sure if it impacts this much. Also tried Bluetooth for Iphone Rotor app and issue is same. Re-calibrated several times but issue still goes on. Quite confused and worried since it was really working fine then all of sudden OCA degree is too high. Just wonder if anyone can advise on this. Thanks in advance all! Just an updater ; moved saddle back where it was and issue is still same. Currently Carbon Qring and inner are fixed with OCP 3…hmm…what would have been gone wrong with degrees all of sudden. It sounds to me like if something went wrong in the calibration process and so the accelerometer is reading the wrong angles. 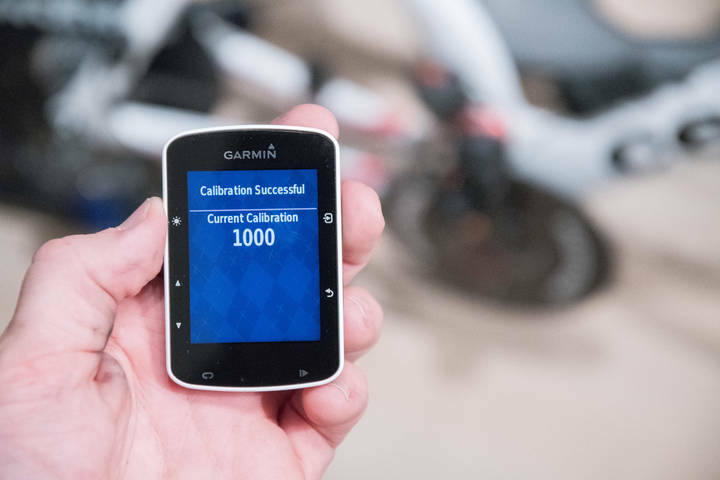 Could it be that you finished the calibration process with the left pedal up instead of down? That would explain that you are seeing OCA numbers higher than 200. The new position of the saddle can for sure be noticed in the OCA numbers, but by something like +5 degrees (depends on the person and pedaling style, as always). I’d like to ask you to repeat the calibration process, making sure of finishing it with the left pedal down. Please contact us at techservice@rotorbike.com if you need any further help. Sorry for late reply. I found that I have to round crankarm rather faster than I usually did. I thought there is no time limit but seems like so. Once I did round it quickly then all gone fine. Thanks so much again for your concerns! – Where are people in the USA buying Rotor 2inPower? The Amazon link in Ray’s review has them for $2100, which seems exorbitant (Competitive Cyclist lists them at $1500). – Is the Aero/Mas version available? – – At what cost? – – Is the 2.5° gradation worth the upcharge over regular 2inPower? – Are there Q-rings which work well with Campy shifters? 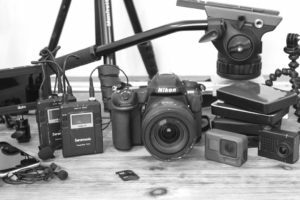 – If (when) a 2inPower needs to be returned for service/calibration, where does it get sent? How long is the turn-around? What is the policy? TL;DR: Where and what to buy to get 2inPower with Q-rings for Campy drivetrain in USA. I’m interested in non-round rings, and of course want to be able to tweak them for greatest benefit. 1) I’m a dealer/coach. I’ll sell them to you directly for that $1500 price plus shipping. 2) The MAS is available, and they’re the same price: $1500. 3) Given that the 2InPower has that AWESOME app, which allows you to literally figure out to the 1/2 degree which position works best for you, I’d say “YES”. Especially since it’s the same price. 4) The MSRP for a set of QXL’s in 53/38 (110) is $278, but your prices may vary. Q’s are slightly less expensive. 5) No idea; Campy’s are so rare these days; almost as rare a Rotor Uno shifters…. 6) I think you’d probably ship them to Salt Lake City. That said – they’re not like other power meters. I’ve got the supersecret software, and I check ’em periodically, and they really are solid (I know I’ll catch hell for it, but they really don’t drift). If you’re interested, gimme ring. 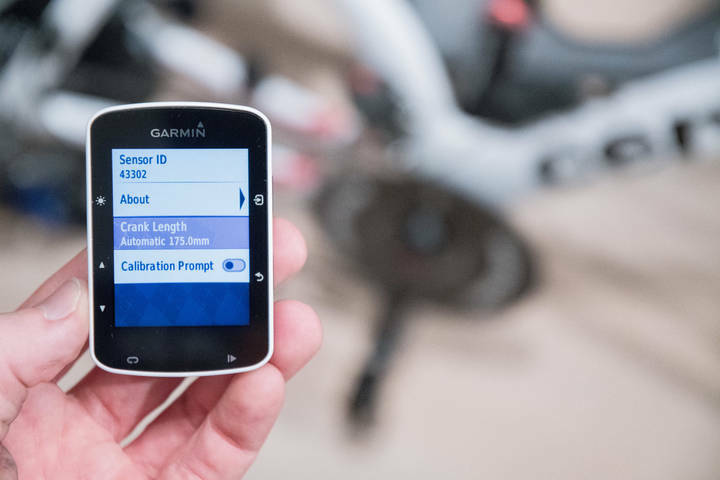 I’ll also help you understand what to look at/for when setting up your Garmin. I paid less than $1500 for my Rotor 2inPower crank + BB at my local bike shop. Installation was included. I have the Aero/MAS version. I already had a set of Q-rings, and they work well with both SRAM and (universal) KMC chains. My new crank has only been on the bike for a couple of weeks. I haven’t had an opportunity to install the special app, record a torque plot, and consider OCP adjustment. But power data is reasonable (I’m a former PowerTap hub user), and I’m seeing left/right balance data for the first time. I’m pleased with the set-up so far. 1) I live in Sydney so can’ comment. 3) Not sure US price. 5) Qring needs to be purchased separately. 6) Yes, I am using 10 years old Campy record 10sp and works perfectly. 7) Not happened to have service or return yet. Just for oval rings ; you might be interested in finding difference between 16% and 10% ovality. I used to use 16% from other brand then moved to 10% Qarbon (from Rotor) and satisfied. Higher number can be felt more harder but I prefer 16% actually. As you know, good thing is 2Inpower is the only crankset-type powermeter which supports oval chainrings (and that is one of the biggest reason I chose). I am curious, do you need two different GPS units to record output from 2 different power meters or can you enable more than one power meter in the same head unit? Nah, I have to use multiple head units. Kinda a pain. I’ve talked to all the majors about adding support for multi-sensor type stuff (of the same kind), and all have talked about doing so, but none actually have. I suspect Wahoo is closest. Else, other options I use occasionally that kinda do this are the Quarq Qollector (can do multi-sensor streaming of the same time), as well as the NPE WASP units (but to a phone). The challenge with both is there isn’t a clear on/off type option – so it’s a bit trickier. I found all of sudden ANT+ reading going to 0 (520 as well as Zwift) then never comes back. 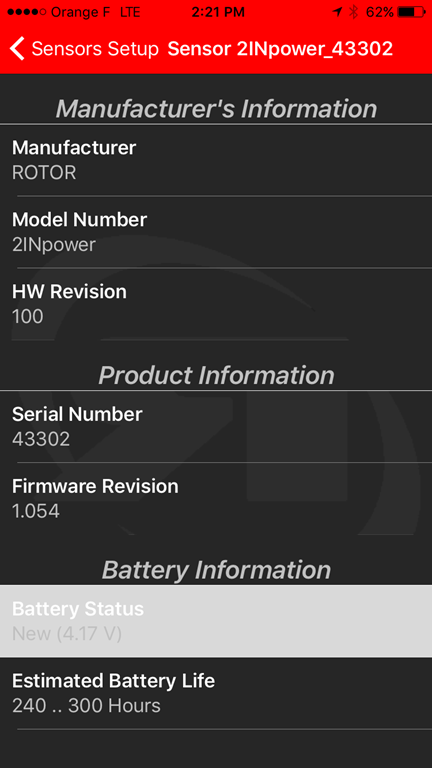 It is strange that Rotor app still reads power correctly. As trial, I ran Zwift on Iphone through Bluetooth and it was still working fine. So waited for an hour for powering off 2inpower then tried again ANT+ but no luck neither while it senses 2inpower’s ID correctly but not the power numbers. Worried much then finally I calibrated again which eventually brought ANT+ signal back. So my question is ‘is it officially not recommended to mix to use ANT+ and Bluetooth at same time?’. 2nd question is easy ; I wish to export GPX or other readable data from Rotor app from Iphone as well as PC version so that I can upload it to Strava for recording mileage. Would it be possible? Regarding your first question, you can mix ANT+ and Bluetooth if they are both in the standard mode, which means that you can only mix them if you are using the “Ride” or “Basic Training” modes of the app, but not if you are using the “TORQUE 360” mode. In case you use the “TORQUE 360” mode through Bluetooth, you can still use ANT+ at the same time, but only though ROTOR’s User Software in the computer. The reason for this is that the “TORQUE 360” mode works at a higher data rate than the standard ANT+ protocol, and devices like the 520 are not prepared to work out of the standard. 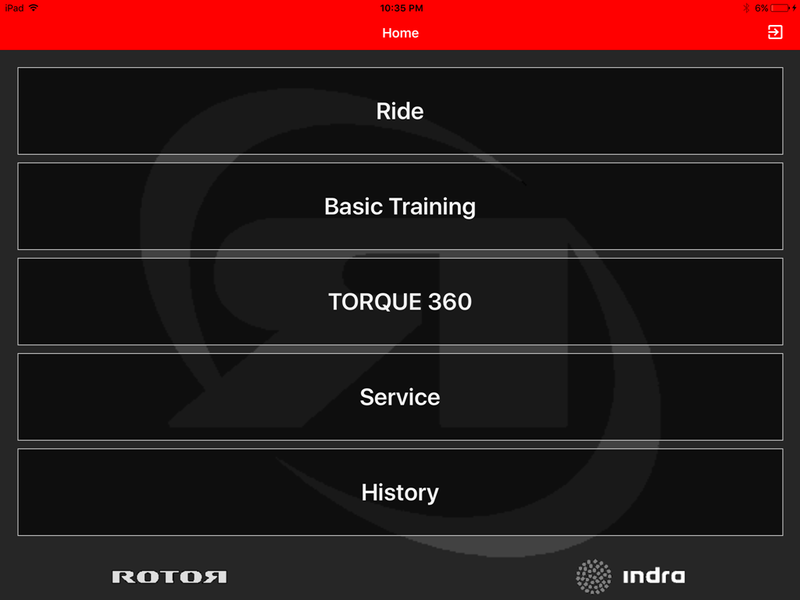 Regarding your second question, you can export FIT files from the ROTOR Power app for those rides recorded with the “Ride” or the “Basic Training” mode, and CSV files for those rides recorded with the “TORQUE 360” mode. For Android devices, you should find a folder called ROTOR Power in the internal storage of your smartphone. In case of an iPhone, you need to extract the files via iTunes (phone icon – Apps – Scroll down and click on the ROTOR Power icon). Hi, very nice review as usual. I have a question about the calibration. Would it be possible to execute the full calibration procedure with a Suunto Ambit 2s watch? or the SW interface in the Suunto is too basic? Same question regarding L/R balance…would it be possible to add this data during the ride? as far as I know the watch does not accept L/R balance as input from a powermeter. Any updates on the indoor issues? Have you bought one yet? Wondering about the indoor issues aswell. Hope they fixed it but can’t find anything anywhere. Can I record distance using 2inpower when riding rollers indoors? Just got my bike with 2inpower (and the 46/30 rings). Seven Evergreen SL – first couple of rides have been really positive. Never had balance before (coming from a powertap) so that’s a new metric for me to worry about. Playing around with the iOS app makes me wonder how I can even ride a bike judging by the pedal stroke reported. I got the 2Inpower a bit more than a year ago and went to a lab and did a ramp up FTP test. It tracks 10+ watts more than the computrainer of the lab. Later I would have the kickr, Powertap G3s. My 2INpower reads +10 watts 3, 5, 20 sec avg. Thats totally unacceptable for a very expensive power meter. Over-reading 10w or more is A LOT. Thanks for making these reviews. Have you considered if magnetic inteference from electricity can be the issue with higher readings for the 2inpower? I note this as my local LBS mentioned that the Rotor could make peak readings when passing hig voltage power lines. However, the local LBS also dissed almost all otter produkts then SRM and Quarq ? Nah, I’ve never heard of this before. Certainly, funky things in general happen around high power voltage lines (for example, sometimes you’ll get ANT+ drops), but I haven’t heard of strain-gauge focused issues in power meters by any vendors. My guess is that something is actually happening at ANT+/BLE level, and causing oddities on the display of the head unit. Thanks, i suspect the rumour is to able to sell something else. As to the ANT+/BLE i guess that would not be Rotor speciffic? I just subscribed to the Data Analyzer tool (awesome stuff Ray!) as I would like to “validate” the PMs I have on various bikes (2Inpower, P2M NG and Quarq Dzeros, depending on the bike), and so far I have run two comparisons of the 2Inpower vs my NEO. Interestingly, I am not seeing the same power inflation on the trainer that Ray saw – my 2Inpower tracks the NEO very well (to my eye at least) and is pretty consistently about 1-2% higher than the NEO, which is both within the margin of error of the devices and reflects drivetrain losses. I have purchased the rotor2in and opted for a q-ring, product has been great so far but i have software integration issues, which i will highlight in the copied and pasted email i sent to rotorbike below. Happy to hear any thoughts on this. Season’s greetings and wishing you an advanced new year. I have recently purchased 2inpower and enjoy using it and training with it. But I guess you are already aware that I have been facing issues with regards to software and using your app and laptop software on iOS and MacOS high Sierra. – MacOs, cannot launch the application on the mac, it was suggested by your support to install a later version of mono which did help launch the application however, computer couldn’t detect bluetooth so it was useless in the end. So I highlighted this to your support and they say that compatibility issues will persist and recommends using iOS apps. I conceded, and i did successfully calibrate using iOS app. but there have been limitations and difficulties which i will highlight in the following para. – so im on an iphone 6s, and i always update my phone to the latest software update. the phone doesn’t detect rotor2in bluetooth. it will not appear on the bluetooth settings page. regardless i went into the rotor app and asked the app to add rotor sensor which surprisingly it did and i renamed in and calibrated it successfully. 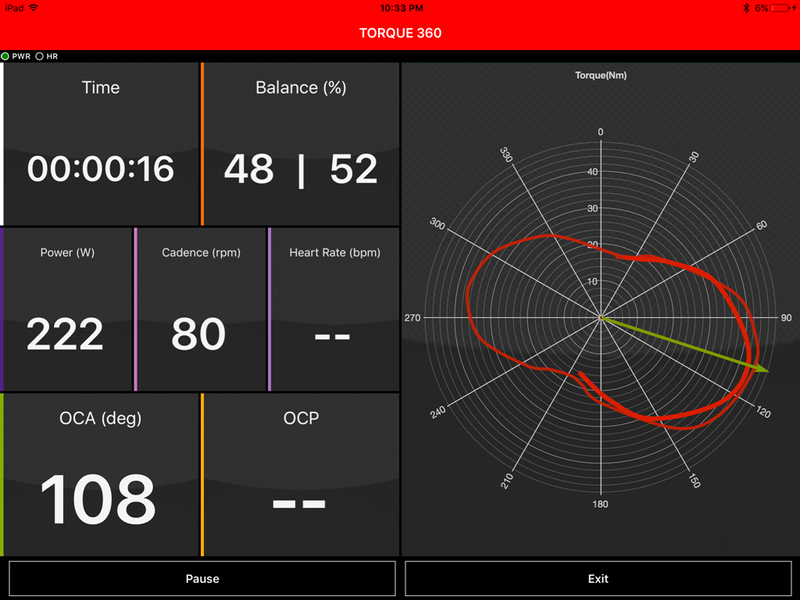 however other features such as torque 360, training etc, cannot be used it cannot detect anything which renders it useless, i cannot analyse all the fun features that the rotor2inpower provides and my q-ring. -so i luckily i have an android device at hand as well, i tired pairing added sensor and all. i successfully did, it appeared on android’s bluetooth page to successfully connect and pair. 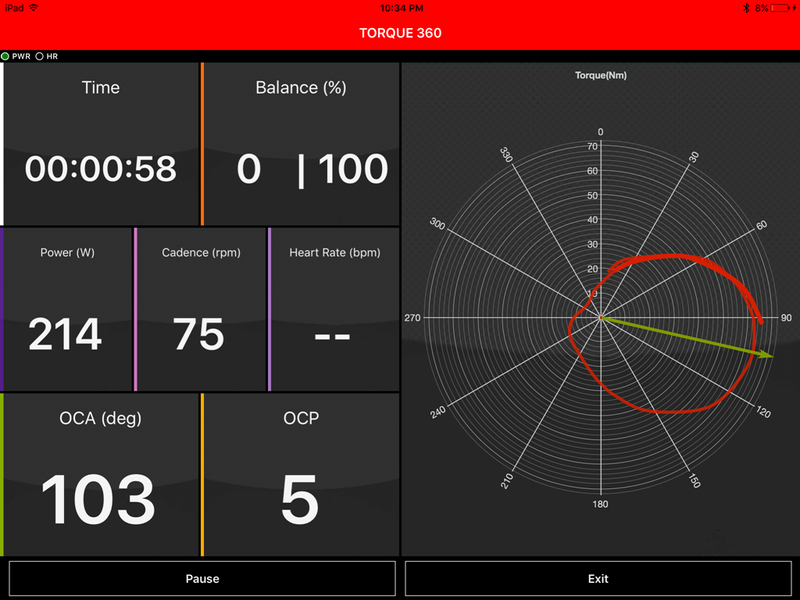 I tested all the other awesome features torque360 and training. I was glad. But still sad at the fact that my iphone is my day to day phone and easier to bring out on rides, i dont want to resort to bringing multiple devices, this is surely not what you intend for customer experience i am sure. – how and when can i use my iphone and mac with my rotor2in and q-ring successfully? 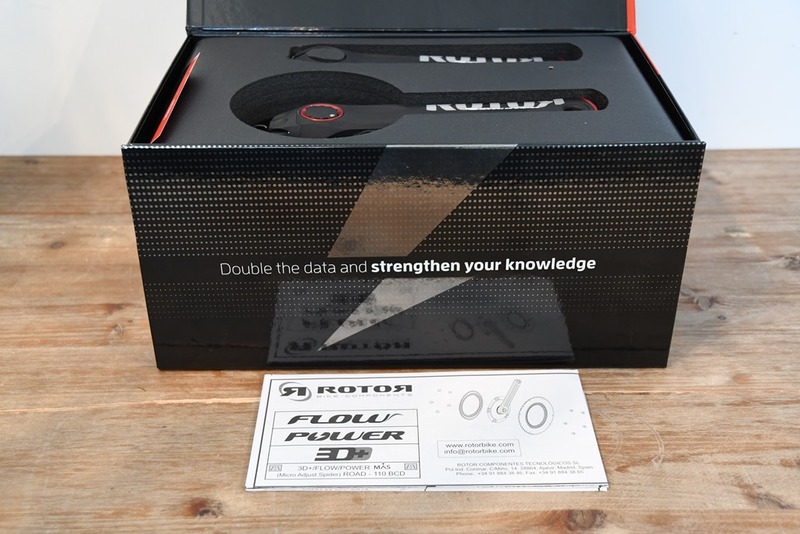 Have you done a review of the rotor in power 3d+ left arm only?? So which should I choose for me Canyon Aeroad? Why should one go for the MAS or the 5 arms? Is anyone else having trouble opening the Rotor Inpower software on their Mac? I’m running High Sierra version10.13.3. First, I installed the Mono program mentioned on the Rotor site, restarted the computer, then installed the Rotor software package. The iOS app will run on my phone but cannot find an option to update the firmware through the app. Any ideas? I recently installed the 2inpower on my CAAD12 and it is solid otherwise, not that I have much to compare it to, as this is my first power meter! Having reached out to Rotor support with another question and receiving no response I figured I’d ask you all. Thanks! Did you try my solution as mentioned in “reply 121” above? Yes, there is the mobile app, but sometimes, you (I) need the computer version. Other, than this, I love the PowerMeter. I’m sorry to hear that you’ve got no answer to your ticket. Let me talk to the tech service guys to make sure that you get a reply as soon as possible. Downloading an older version of mono allowed the program to run on my laptop, but the power meter is not connecting through Bluetooth. Looking forward to an update to fix the issue. Also, I am not able to update the firmware through the iOS app. Are there additional steps I must take? Hi, I have used the rex 1.1 on my MTB, with cero issues for several years. And now the new 2inpower direct mount, on my road bike by the same way (Previously VECTOR 2, I did not like it). The ROTOR powermeter in my opinion are beautiful, very reliable, and accurate. I am spanish, And a very proud customer of ROTOR COMPANY..
Have you got a review of the new 2inPower DM in the pipeline? Am in the market for a rotor PM, and wondering if it’s worth hanging out for. Or even just wait and pick one of the old ones up on sale! In my discussions with ROTOR at Sea Otter, the units are all the same. It’s simply slight differences with the branding and the associated cranksets they come with. Got the new DM and very happy with it. Now I get much more data compare to one side STAGES. And it looks great! So we can expect the same indoor issues with the “new” DM as the original 2inpower? I haven’t heard of any shifts with the secondary units. Great review Ray as always. I know this review is kind of old now but there is one topic which may not have been adressed: the strenght of the ANT+ signal. On race day, on T1, my Garmin 735XT won’t connect automaticaly to my Rotor 2InPower. I have to launch a manual connection (which implies to stop the time > Parameters… a real pain). 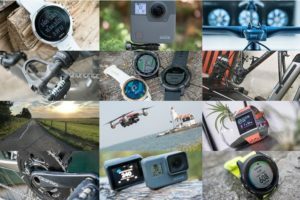 Does anyone face the same issue with another GPS watch and the Rotor 2InPower or other powermeter device ? I use to have a Fenix 3 and don’t remember having faced this problem before. So I saw something similar to that at one point I believe, but I thought it was fixed by a firmware update. It wasn’t that it never connected, but that it was a significant delay (like 5-8 seconds) until it registered. It wasn’t a FR735XT though, just an Edge unit. And it didn’t take any connecting, it just happened but delayed. I don’t really have a good solution for you though, any chance you’ve updated the FR735XT? Thanks Ray for your quick reply. My 735 XT is up to date with the last firmware installed. Yeah, so there used to be (perhaps there is) some situation whereby after a period of time the Garmin device (many devices) would stop looking for sensors it couldn’t find upon powering up and starting. meaning, it’d search as you’d expect initially, but then it would go into a lesser search pattern. Normally that wouldn’t be an issue unless you started a sensor 30 minutes into things. Many thanks Ray. It basically happen in all my tri races. I’ll check with Garmin and let you know if I get any answer. Thanks ! I would not recommend the 2inPower. The shifting is so bad! It costed me a lot of Money and nerves… but with no success. It’s just not as good as Shimano due to patent reasons. By the way: I was using the round chainrings (not oval). Now I have Quarq with Shimano chainrings. And that works PERFECT. I’m not sure what you’re saying makes sense. I have the Rotor with Shimano chainrings and it works fine (maybe even PERFECT). 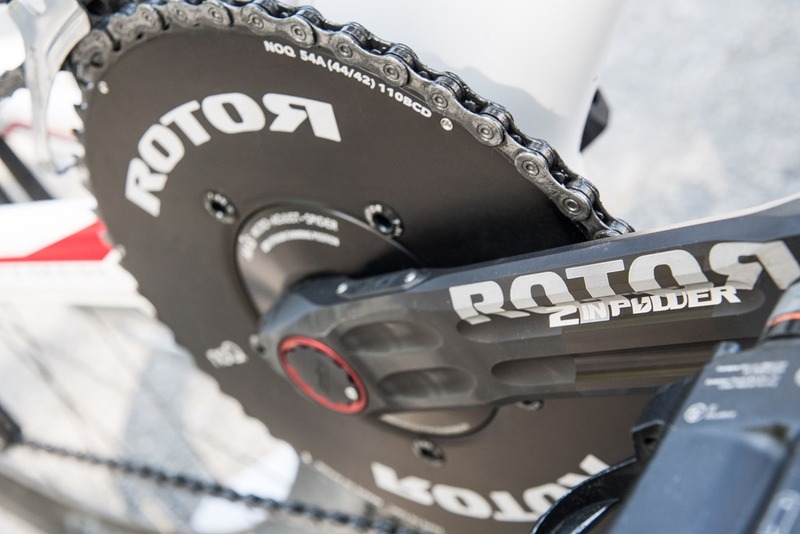 Why is Quarq with Shimano chainrings a comparison with Rotor with Rotor chainrings. I imagine the shifting problems you’re having are to do with the chainrings. Try the Shimano chainrings on the Rotor crank. In my case it was not possible to change to shimano chainrings on the 2in power due to the pitch circle diameter. Otherwise I would have tried this. 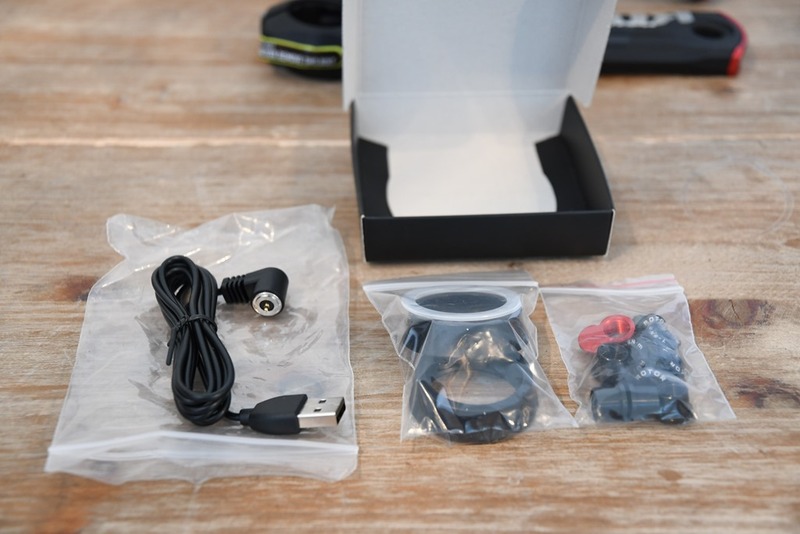 I recently bought the 2inpower DM road and linked it to my garmin Edge 820. Pairing the power meter with the edge 820 was straightforward and easy. I am curious what datafields can be shown on the garmin. A little time ago you posted on the cycling dynamics as well. But this does not provide the specific answer to this combination. I can only see the total power in the cycling dynamics field but not in other data screens. Pedal center offset, I presume, will not be available. But can the cadence be listed in any way? I use the garmin cadence sensor but could move this to another bike if the cadence from the rotor could be listed. Same for other metrics. Also having a data-field (outside of cycling dynamics) that lists the total power (combined power during the race, rather then left or right alone) would be very welcome. Do you know if this can be setup? Finally, some comments on the computer software. The software is not the best around to my humble opinion. I have tried to install it on a mac following the instructions from the webpage. (garmin connect not active in the background; with and without mono installation). Unfortunately, the software fails to launch. 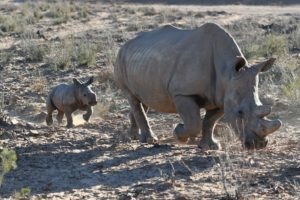 Any comments here are welcome as there is very little information on the web. Thanks for your effort to reply. Please write us an email to techservice@rotorbike.com and we’ll help you install and launch the User Software in your Mac. You can also find some instructions about how to do the installation in the tech video: link to youtube.com (between minutes 1:30 and 2:30). 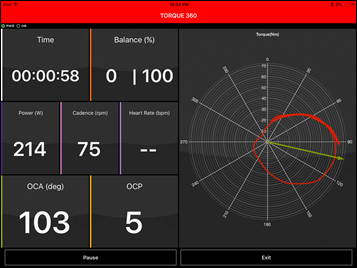 To access the standard metrics you mention plus ROTOR proprietary metrics: TORQUE 360 and OCA, the ROTOR Power application is very easy to install and use. 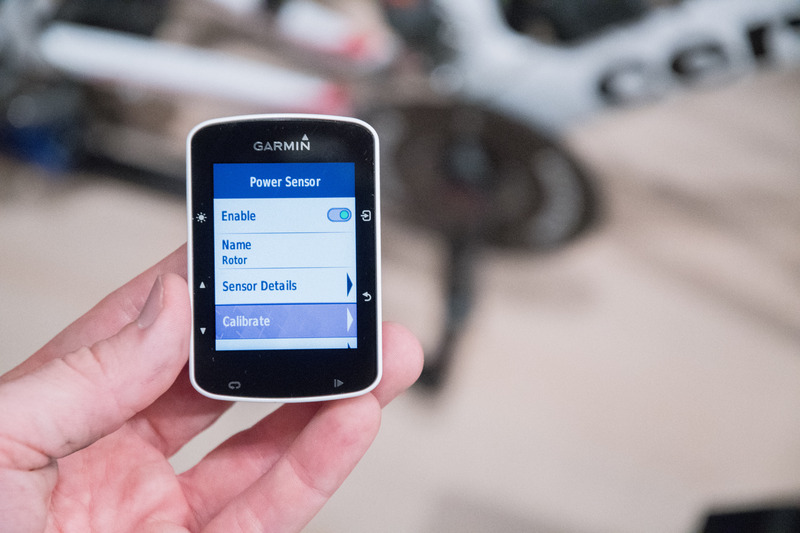 The Garmin Edge 820 should show all the standard metrics (total power, cadence, power balance, TE and PS) in the standard data-field screens, outside of cycling dynamics. Manu thanks for reaching out. I will sent a direct message to the email listed for some further assistance. Ps. I presume I can also use this email to address questions with regards to data fields for the edge 820 (outside of cycling dynamics and power) and some related stuff. The edge 820 doesn’t seem to pick up a cadans sensor (other than the Garmin one). And where can I find the power phase in the Garmin fields? Once more, thanks for the prompt reply and assistance. So many versions of this 2InPower! Are these all different or interchangeable , what’s going on? 3. And rotorbike.com website now only shows “Direct Mount” – with no spider! Is 3. the current version? 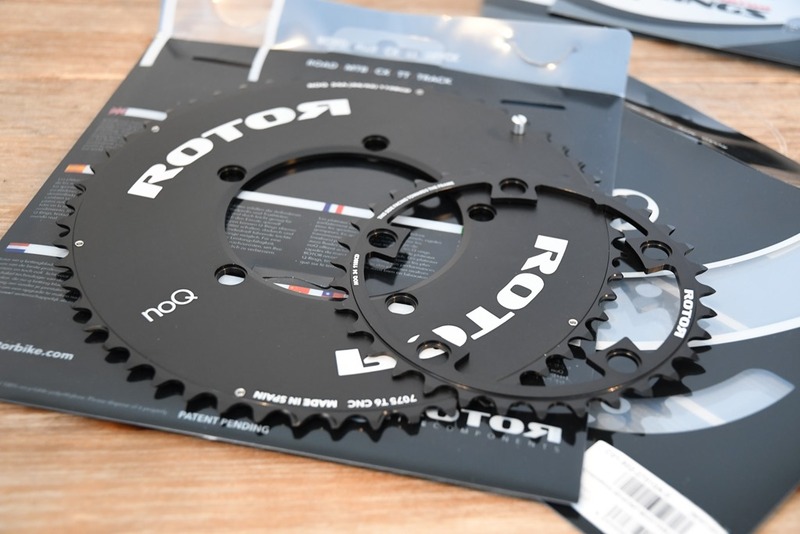 Yes, number 3 is the current version, as it is compatible with ROTOR’s new range of Direct Mount chainrings. Regarding the other 2 versions, difference was just the spider, being the “Micro Adjust Spider” the aero one and the one that allowed fine tuning Q Rings’ OCP positioning. Please write us an email to techservice@rotorbike.com and we’ll be happy to help you. Is possible to install a 2inpower DM in a bb30a Bottom Bracket? If the answer is yes, how can I get it? Go to the rotor’s spacers list html and use. I have spacers left if yo can’t get the ones you need. 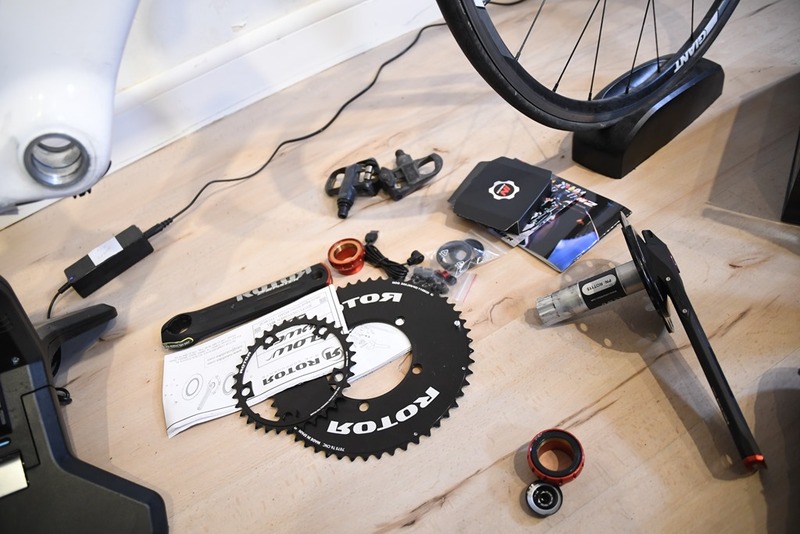 @Rotor : Any chance to have same integration with Wahoo (OCA and Torque 360) ? I hope we can have this kind of collaboration with some other bike computer manufacturers in the future. 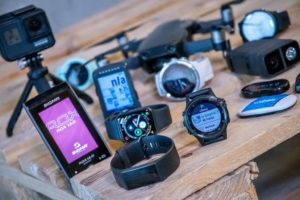 Irene, any chance that you develop an app for Garmin IQ ? I don’t know to what extent it is possible from a tech stand point. After a quick look on the latest ConnectIQ it looks it’s not possible for now, as only ANT communication with the sensors available through the API. AFAIK high frequency torque data for OCP goes va BTLE. Hi Irene, I received the email about the updated OSX software and I chose to install it, and now the software won’t open. Is there a fix? Seems like the OSX app has continual issues..
I’m sorry to hear that. Can you make sure that you’ve installed the latest Mono version and properly unistalled the older one? If you’ve doubts how to do so, please send an email to my colleagues in the tech service department (techservice@rotorbike.com) and they’ll be happy to help. If there is a way to get OCP via ANT+ interface, I’d be interested to see if ConnectIQ App would be a viable option. Please get in touch by email, i may need the protocol description, instead of reverse engineering what is it about. I’m thinking about investing in a single side Rotor Inpower, but I have one question: do you know if it be possible in a year or 2 to upgrade to the dual side 2Inpower without buying the whole set-up, just upgrading my product with the missing parts? I have also contacted Rotor support, I will keep you in touch if they reply to me. I highly doubt this is possible. Inpower has left crank stuck on the axle. In the axle is the power measurement. On the left crank is the antenna. 2inpower has the right crank stuck on the axle. On the right crank is the right power meter and the antenna. On axle is the power meter for the left leg. I don’t think you can disamble the axle and the crank. I just got a 2inpower DM and I’m having massive temperature changes, balance goes from 70/30 to 30/70 depending on the temperature of calibration and so do total W. Anyone has faced this kind of problem before?. Has anyone tried running their 2in Power with SRAM AXS? Other than the obvious chaining size difference, I’m wondering if I get away with mining then onto a new bike with AXS. Hi. Did you try to pair to Garmin Forerunner 935xt? I have no problem pairing to Garmin Edge 520 and get 50/50 power balance, but when pairing to the 935 I get power balance of 25/75. I think it is because it is paired via bluetooth but I cannot find a way to “force” the pairing to be ant+ and Garmin could not help. I do not think Rotor provide telephone support to the consumer but I will send them an email. Just curious if you already figured this out. Does anyone knows if part number ROT115 is new DM version, or older one with 5 arm spider non DM? Part number ROT115 corresponds to both the 2INpower with the 5 arm spider and the DM version. From an electronics point of view they are both the same. I figured that, already purchased and installed 2inpower with DM 46/30 rings on my gravel rig.